One score and twelve years ago I departed the native soil of West Virginia to set roots in my adopted state of North Carolina. My three decades of residing in the Tar Heel State have brought witness to the railroad scene there encompassing enumerable changes within the industry that continue to this day. Unlike the first phase of my life in the Mountain State, however, the arrival in North Carolina post-dated the era of when the flags of predecessor roads fell. Whereas my younger years experienced the pre-CSX and Norfolk Southern generation of West Virginia railroads, that opportunity was missed in North Carolina. During the past fifteen years of a renewed historical interest, my exploration of rail routes is skewed with a lamentation of missing them from a past time. The topic of this piece, the NS L line---formerly a Southern Railway line between Winston Salem and Mooresville----falls into such a group. Further expounding the interest is the fact that this route---along with the AT&O---was my introduction and first marked exposure to the railroad scene in North Carolina. The story of the L Line is that of a once secondary main line directly connecting Winston Salem and Charlotte presenting an alternate route to the Washington-Atlanta main via Greensboro. With the more direct routing due south, the L Line was utilized in conjunction with the former AT&O route between Mooresville and Charlotte. 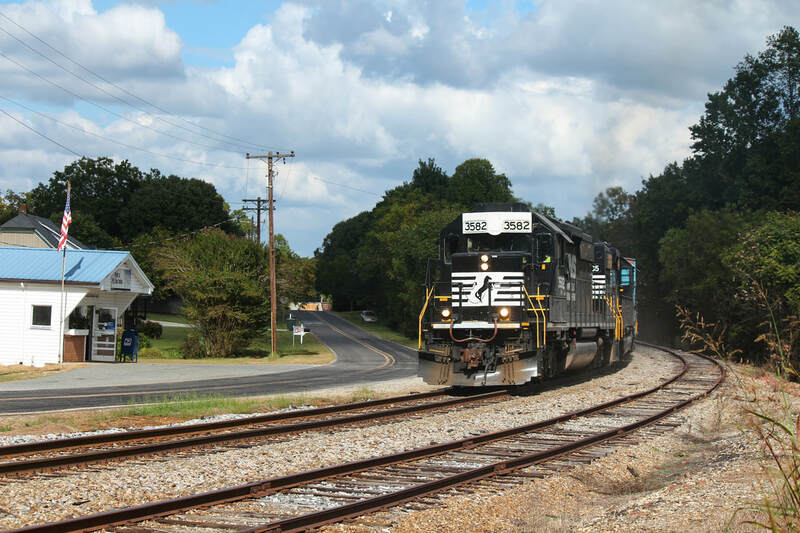 In addition, the completion of the railroad provided rail service to communities within the rural regions of Davie and Rowan Counties. It was strategic as a passenger route connecting Winston Salem and Charlotte as two primary destinations as well as providing connections beyond those two endpoints. Industrial development along the L Line was concentrated at Winston Salem and in the smaller cities along its course--in the rural reaches, it was sporadic. 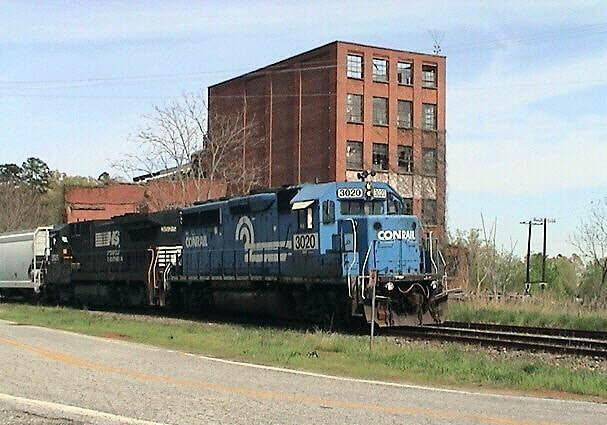 The railroad continued its operation as a secondary main into the 1980s until after the completion of Linwood Yard on the Atlanta-Washington main north of Spencer. Ultimately, the construction of this facility changed the traffic patterns of the Southern Railway not only on the L Line but other regional routes as well. 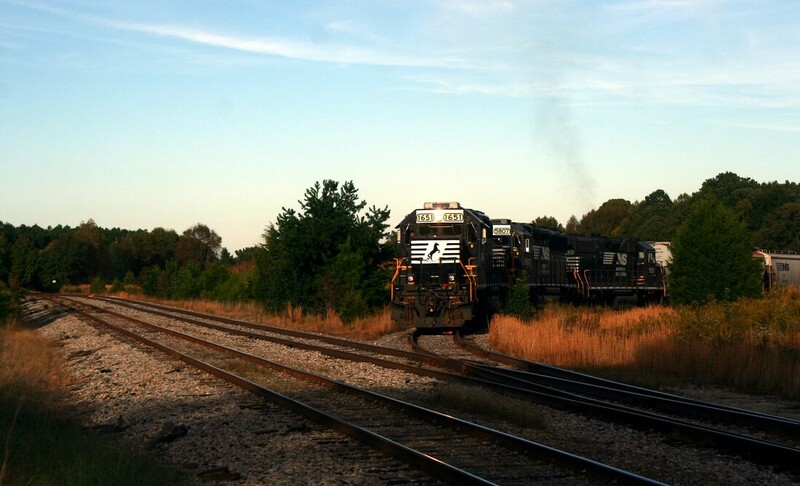 Modern times under the banner of Norfolk Southern have witnessed the operation of the route as a branch line served by two dedicated trains by track authorities as the line is not signaled. 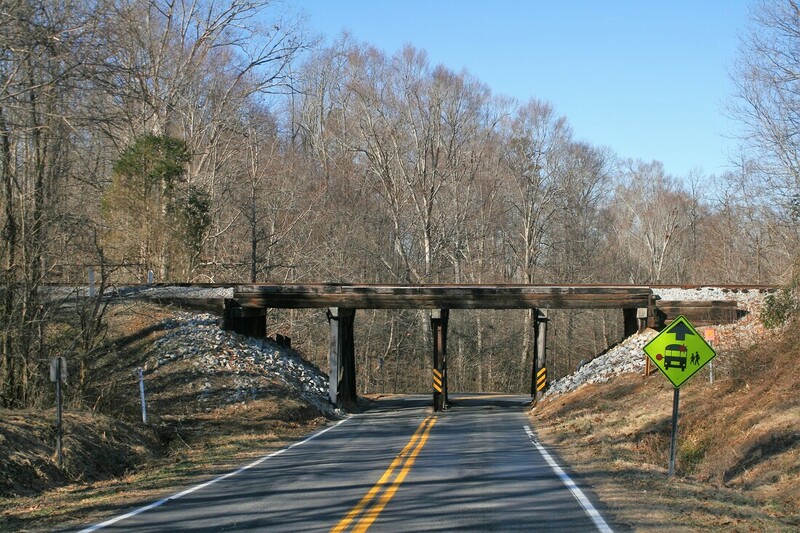 Ironically, the most densely populated sector of the route between Winston Salem and Clemmons was taken out of service due to a condemned bridge--NS to date has opted not to repair or replace it. Because of this obstacle, the possibility of through traffic on the L Line is eliminated and the operational base of its route shifted to Barber. There are no spectacular scenic wonders to behold along this rail corridor--no high mountains, tunnels, or large bodies of water. Yet it is a placidly beautiful territory the route traverses. Passing through predominately rural terrain, the railroad meanders through rolling hills marked with cuts and open territory bordered by farmland. A number of stream crossings are marked by unique combination bridges of varied construction. 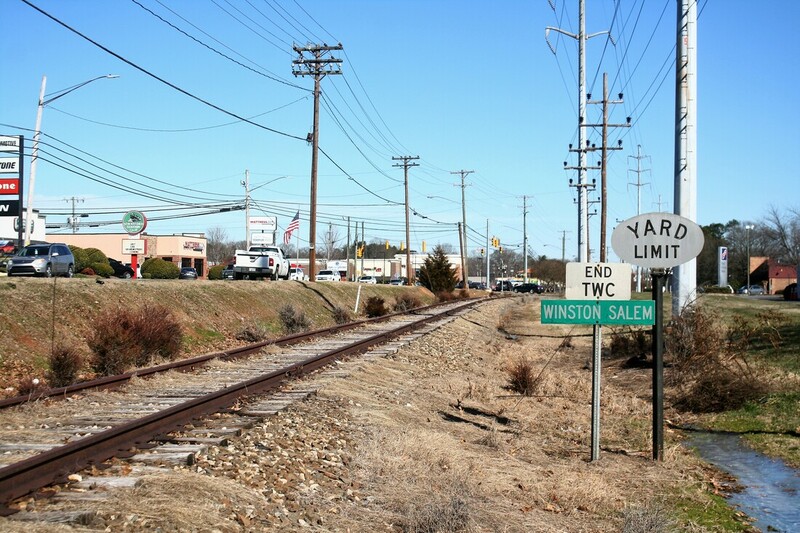 Small townships line its right of way interrupted by smaller cities--only at Winston Salem does the railroad convey an urban setting. It concurrently embodies telltales from the past as well as reflecting an active industrial setting entrenched in the 21st century. Finally, the L Line is a secondary route that eluded the camera lens in its prime when it served as a through route between Winston Salem and Charlotte. Photographs taken along its course are scarce before the change of the millennium but with the advent of digital photography, a respectable gallery of images now exist of contemporary trains at various locations. The only area that is an exception is the out of service sector from Winston Salem to Clemmons. Included in this treatise are train images taken on the route by the author and others—predominately at the southern end of the line between Barber and Mooresville. 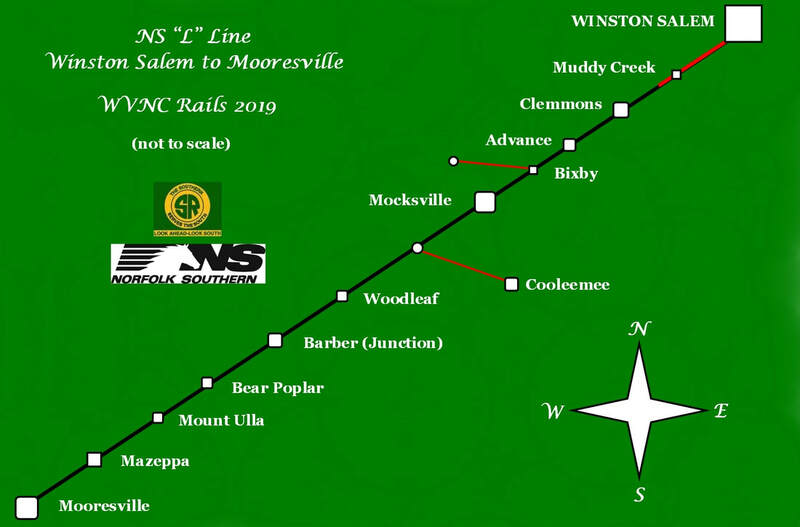 "NS L Line-Winston Salem to Mooresville" can be considered a companion piece to the earlier published "ATO-Statesville to Charlotte" on WVNC Rails. Both routes are historically linked and remain operationally intertwined to the present day. As the American railroad network continued its expansion during the late 1800s, there was nary a city of any size that did not wish for the passage of a line through its limits. The coming of the iron horse meant prosperity by means of developing commerce and a means to travel to points near and afar. Winston Salem (then Winston and Salem until 1913) was no different in its aspirations. By 1910 the city had transformed from a location with no rail service to a hub with radiating routes which emanated to and from. 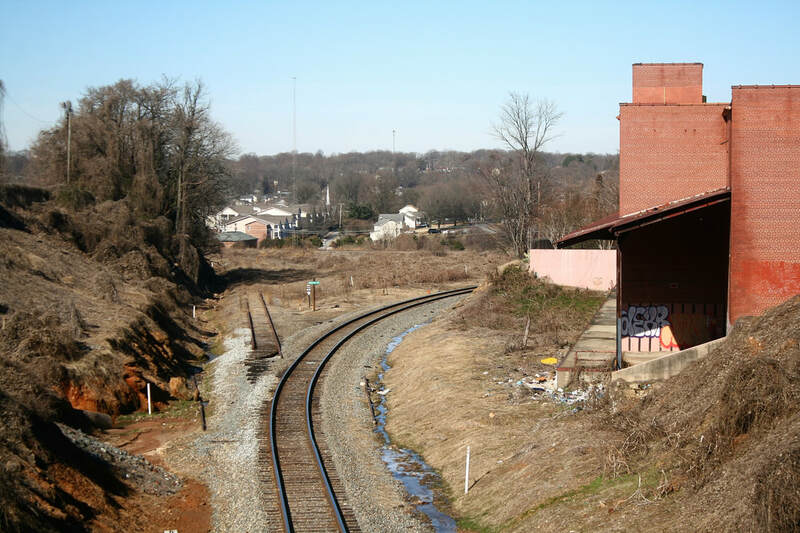 From the arrival of the first train on the Richmond and Danville Railway (Southern Railway predecessor) from Greensboro in 1873 to 1910 with the construction of the Winston Salem Southbound Railway, the city evolved into an industrial center with connecting rail routes. During the interim, the Roanoke and Southern Railroad (Norfolk and Western Railway predecessor) had reached the city and in 1880---the focus of this piece---the North Carolina Midland Railroad was chartered and constructed a route from the city in a southwesterly direction to Mocksville. This short extension was acquired by the Richmond and Danville Railway and ultimately absorbed into the enveloping Southern Railway network in 1894. 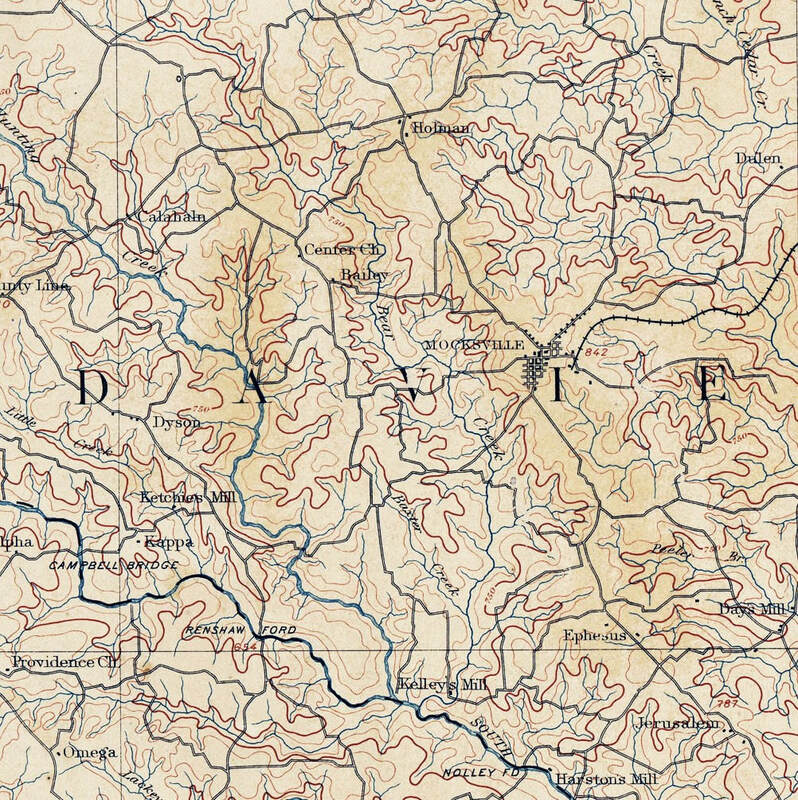 An 1891 topo map depicting the Mocksville area within Davie County. 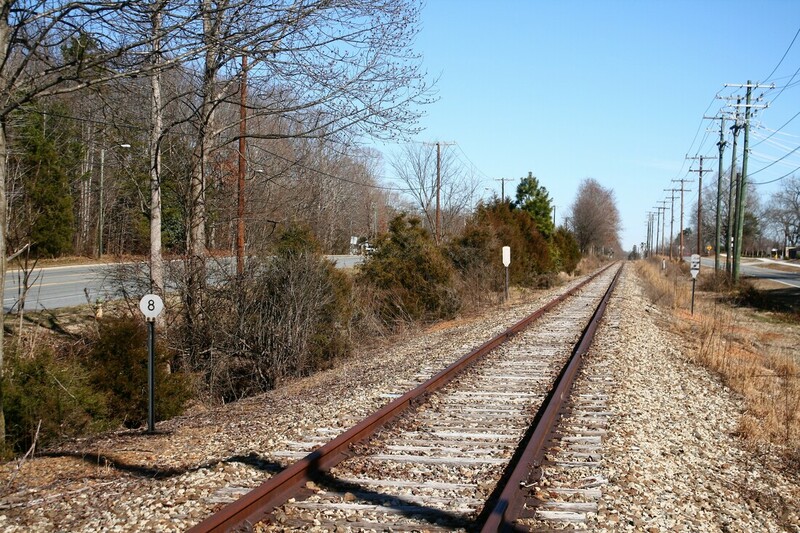 At this date, the North Carolina Midland Railroad built from Winston Salem terminated here and it would be another seven years before the line was extended to Mooresville. 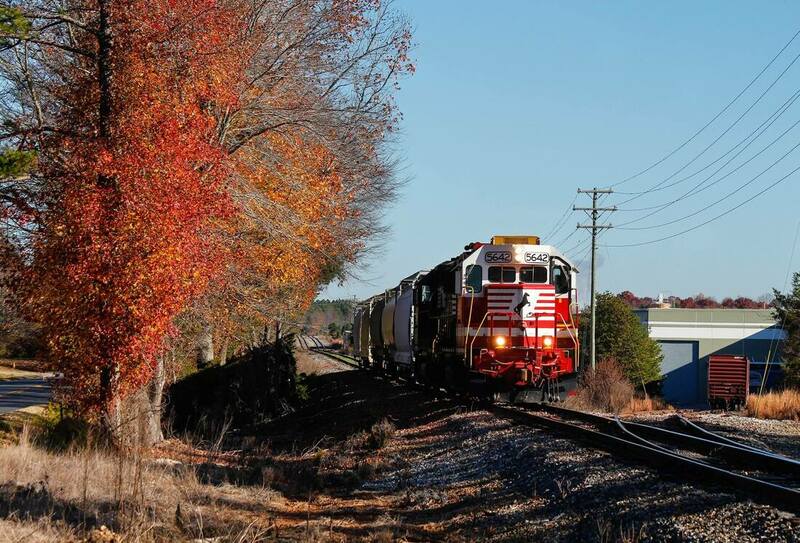 For seven years, the railroad was operated as a branch extending from Winston Salem to Mocksville also serving the communities of Clemmons and Advance on its course. 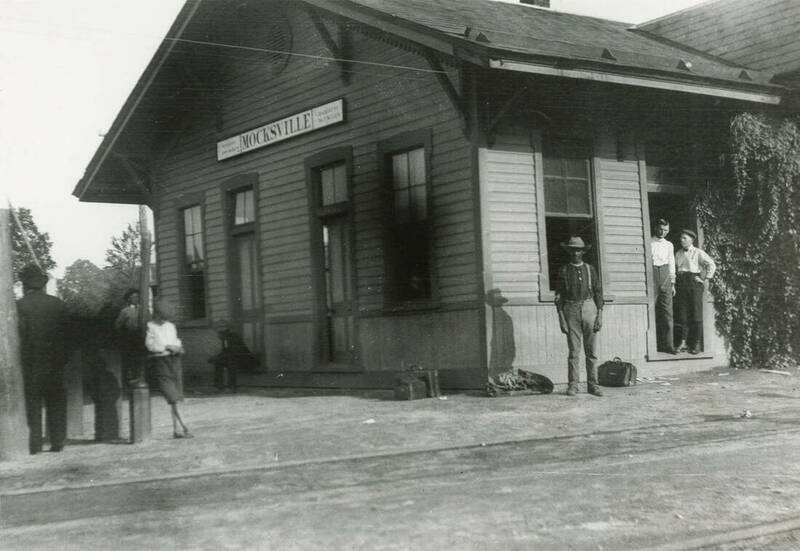 Ultimately, in 1898, the Southern Railway--now the operator of the line--decided to extend the railroad from Mocksville to Mooresville increasing its length to 54 miles. 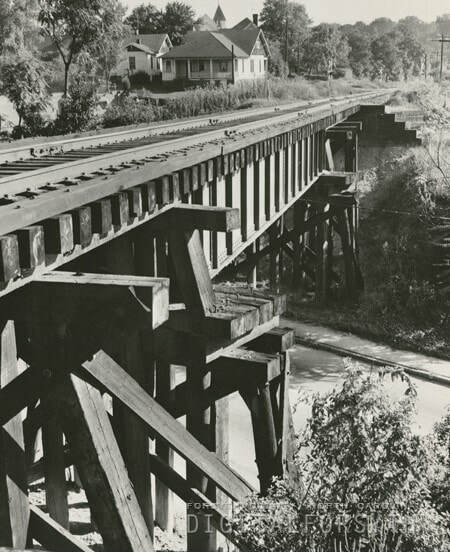 As the construction progressed, the communities of Cooleemee, Woodleaf, Barber, Bear Poplar, and Mount Ulla anticipated its arrival and a connection to the rail network. Two of these towns already had established rail service-- Barber had been traversed by the Western North Carolina Railroad on its route between Salisbury and Asheville. 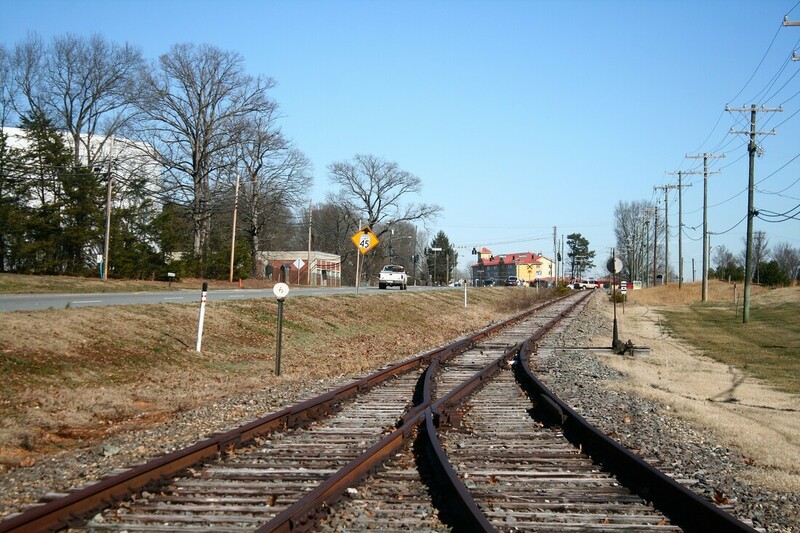 To the south, the Atlantic, Tennesse, and Ohio Railroad (AT&O) passed through Mooresville on a route connecting Statesville and Charlotte. Both of these rail corridors were also absorbed into the Southern Railway. 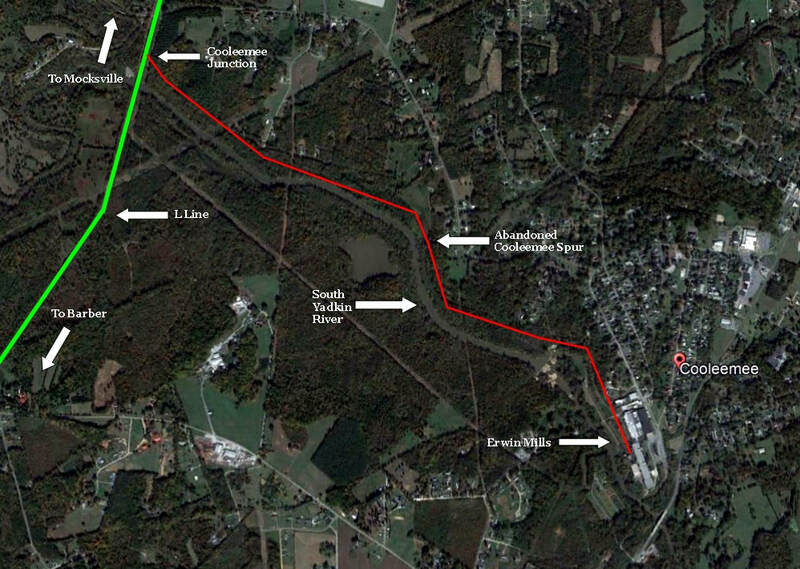 As a result, the extension of the railroad south from Mocksville established junctions at Barber and Mooresville of which the latter was the more paramount. 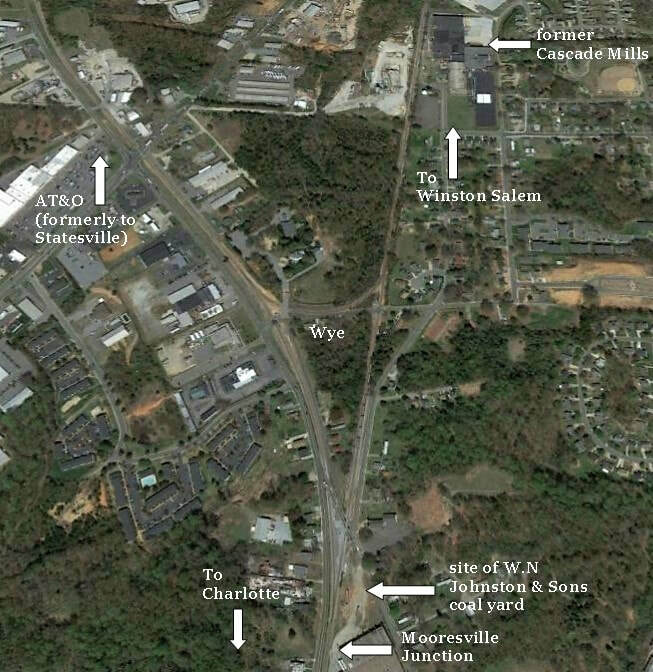 The connection to the AT&O at Mooresville had formed a through route directly connecting Winston Salem with Charlotte. 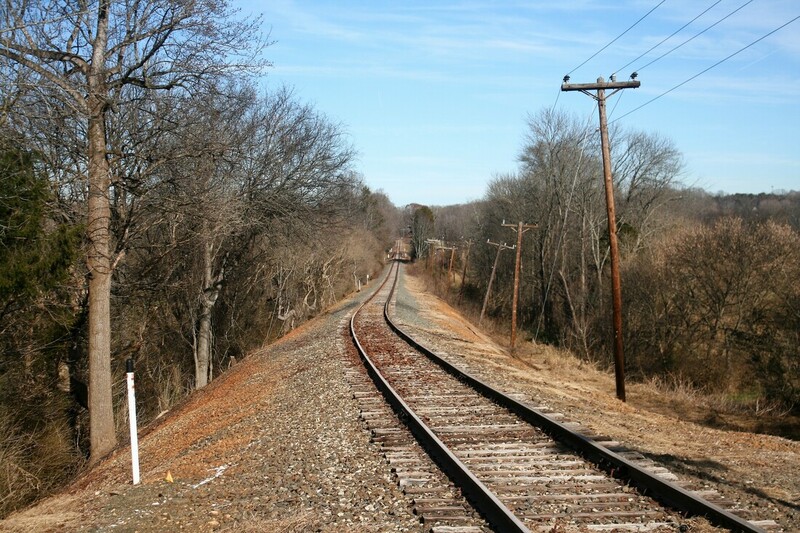 Throughout the 20th century covering roughly an eighty year span, the railroad operated as a secondary main line. Scheduled manifest trains transported three primary products---furniture, textile, and tobacco products--which dominated the central Piedmont commerce. Winston Salem was the predominant commercial base but other shippers of consequence dotted the route that was otherwise rural in character. Passenger trains moved patrons between the two endpoints of Winston Salem and Charlotte which also provided connections to points beyond. This remained in effect until the 1960s when the automobile and airlines had all but dispatched the passenger train into oblivion. The decade witnessed the widespread abolishment of the remaining passenger service throughout the rail network. 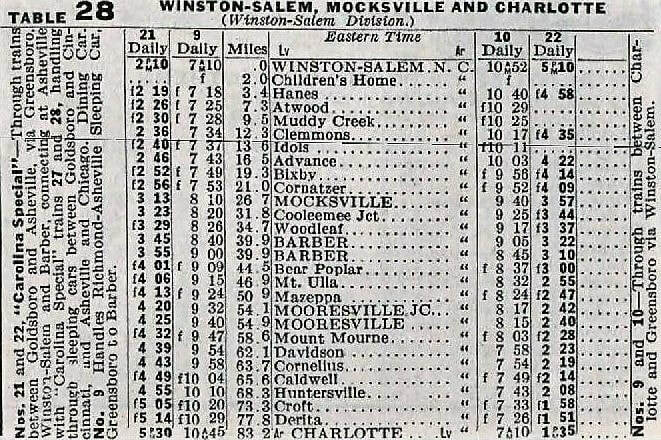 A 1925 Southern Railway timetable of the Winston Salem-Charlotte route. At this date, four scheduled passenger trains served the route which also utilized the AT&O and provided connections via other lines. The harbinger of change that affected traffic patterns on the L Line was the late 1970s-early 1980s time period with the construction of Linwood Yard. Throughout the century, the center of regional operation was the Spencer Yard for classification but Southern Railway decided to build a more modern facility with greater capacity. Once Linwood was on line, operations were most impacted on secondary lines such as the L Line and AT&O routes that effectively experienced the decline or outright abolishment of scheduled through traffic. Traffic patterns became locally based. 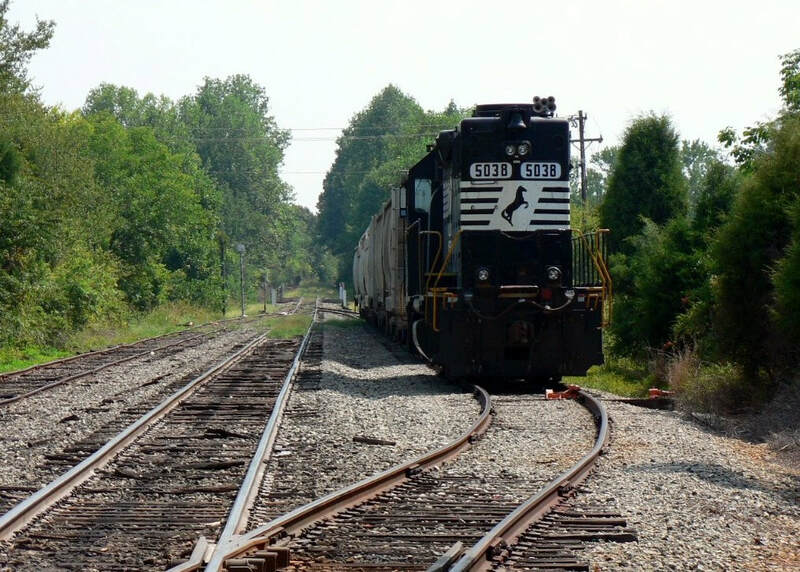 In 1983, the newly formed Norfolk Southern Railway abandoned a section of the AT&O route between Statesville and Mooresville thereby leaving the L Line as the northern entrance into Mooresville. 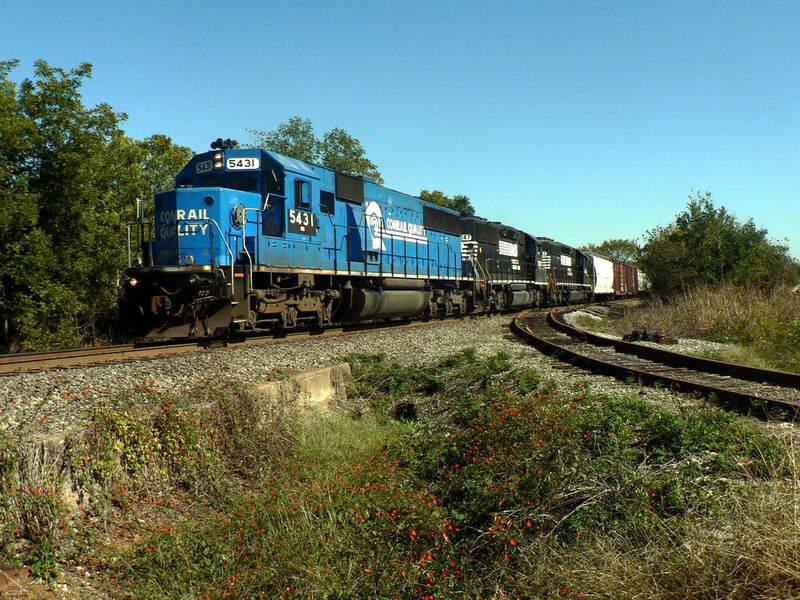 However, it was not until the late 1990s that local service to Mooresville was inaugurated via the L Line--previously, remaining shippers along the AT&O were served by a daily turn from Charlotte. 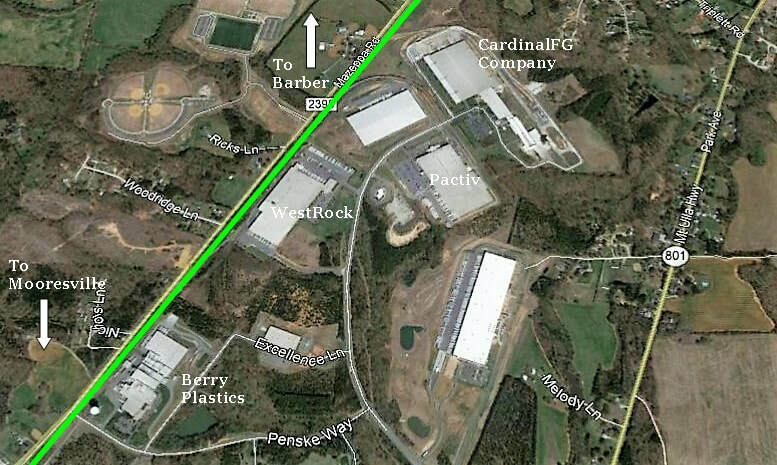 Two concurrent developments eliminated turn traffic from Charlotte by switching it to Barber: (1) All of the shippers between Mooresville and Huntersville had disappeared and (2) the rapid development of an industrial park along the L Line north of Mooresville at Mazeppa. The L Line had not received any significant upgrades until the advent of modern times. Its trackage remained as jointed rail and the majority of bridges--except for street overpasses in Winston Salem-- were maintained as is without any rebuilds. 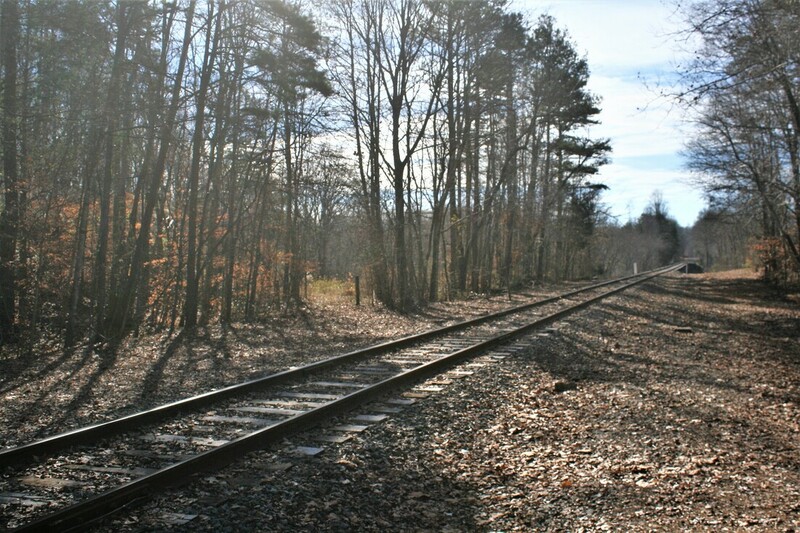 Coinciding with the development of Linwood Yard, a northeast leg was constructed at Barber connecting the Salisbury-Asheville "S" Line and the L Line north of the junction. 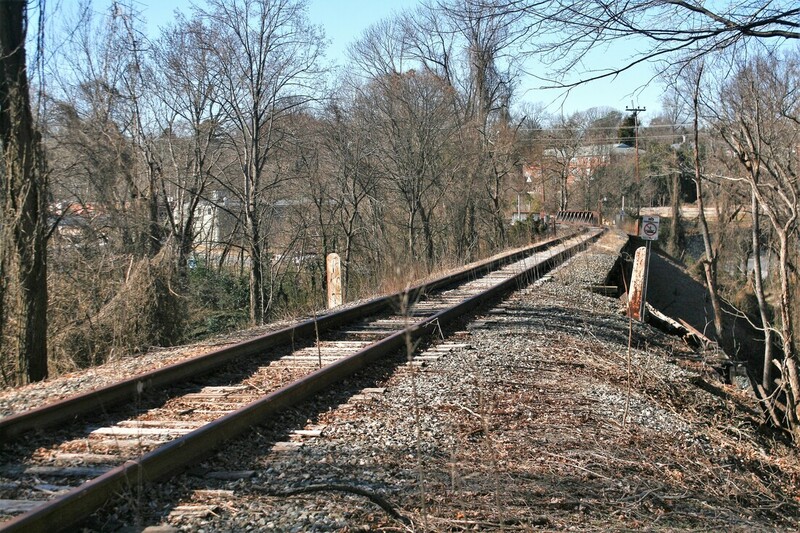 A connecting track was added in the 1980s between the K and L Lines at Winston Junction which created a wye and welded rail was also installed in Winston Salem. 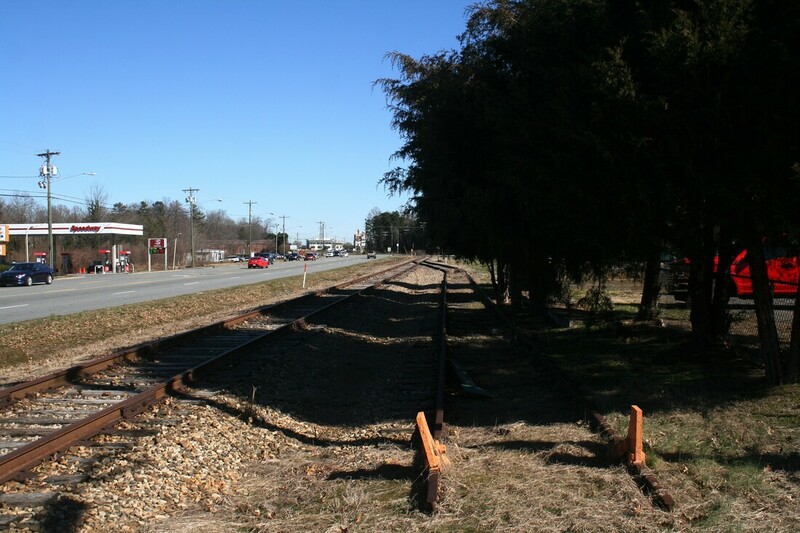 During the 1990s, the section of railroad between Barber and Mooresville was rebuilt with welded rail. But by the year 2000, the L Line was eliminated as a potential alternative through route. 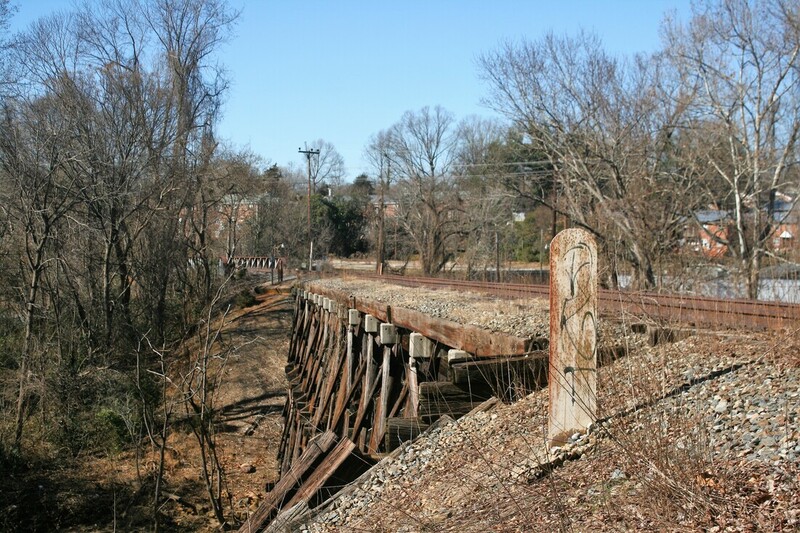 The trestle spanning Peters Creek in Winston Salem was condemned and taken out of service. 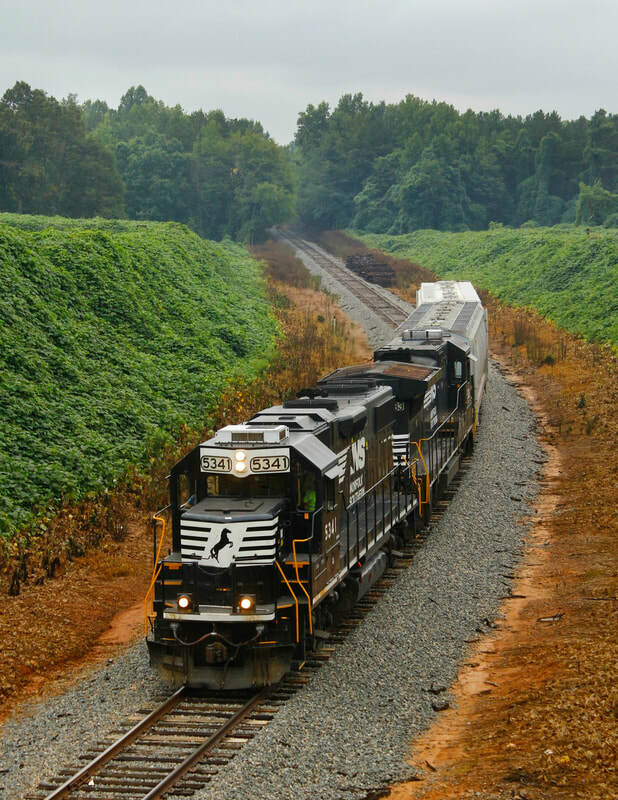 Norfolk Southern has deemed the expense to repair it unnecessary thereby operationally severing the route between Winston Salem and Clemmons. As a consequence, all freight on the northern section of the route can only move from Barber. The L Line last witnessed scheduled passenger service on its rails during the 1960s with the Carolina and Asheville Specials. This did not end passenger trains on the route, however, as there were notable railfan excursions that subsequently traversed the route. During the era of the Southern Railway Steam Program from the 1970s until its end in 1994, various trips utilized the L Line. A partial listing of locomotives that ran its rails would include the ex- CP Royal Hudson 4-6-4 # 2839 , ex- C&O 2-8-4 #2716 , N&W #1218, Southern Railway #4501 and the N&W #611 . Two scheduled daily locals serve the length of the L Line today--NS P23 and P25. With an operational base at Barber, traffic for the two trains arrives via the "S" Line from Linwood Yard via Salisbury and to a lesser extent, from the west at Oyama Yard in Hickory. The two primary trains providing this connecting/transfer service are NS P60 and P61, respectively. NS P23 serves the route south from Barber to Mooresville which also includes industry on the active portion of the AT&O route. 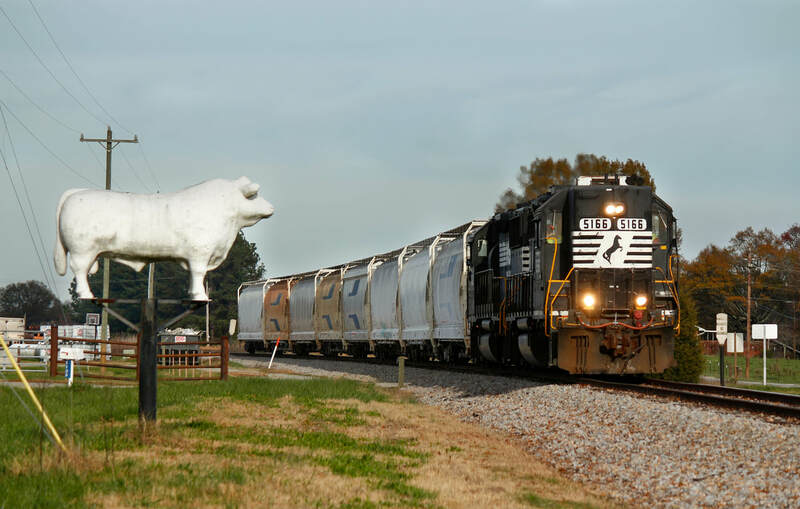 This train moves the lion's share of traffic on the line---Mooresville is the highest volume location on the entire route. On the north end, NS P25 serves the longer but lighter density sector between Barber and Clemmons. The construction of the North Carolina Midland Railroad to Mocksville in 1891 spurred development in the western section of Winston Salem (then only Winston). Industry had heretofore been concentrated in the heart of the city extending to the south in Salem. 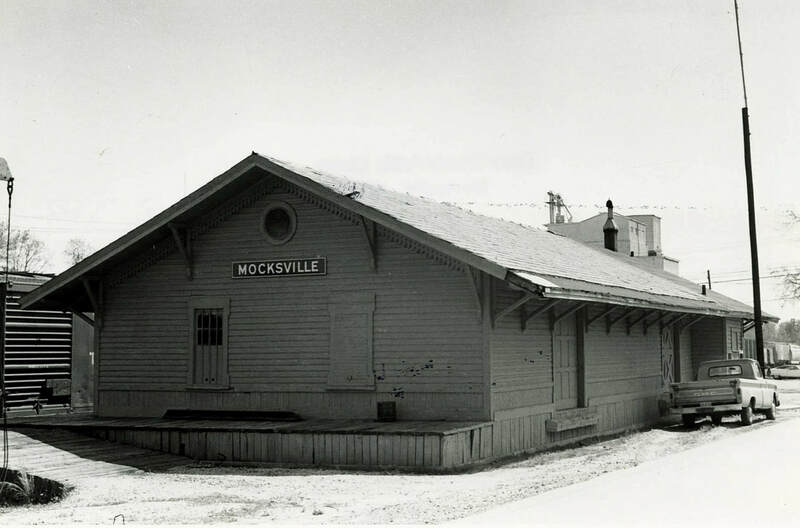 Equally as important was the establishment of passenger rail in this region of the city reaching into Davie County at Mocksville. Once the railroad was extended south to Mooresville in 1898 thereby reaching Charlotte via the AT&O, its full viability was realized. A connection was made in the Trade Street area establishing the diverging route to the south dubbed as Winston Junction. A 1917 Sanborn map that includes Winston Junction where the Southern Railway split. The line to Mooresville (L Line) diverges left and to the right, the route to Rural Hall (K Line). Export Leaf Tobacco Company was the first shipper served from the L Line and the building still stands today. 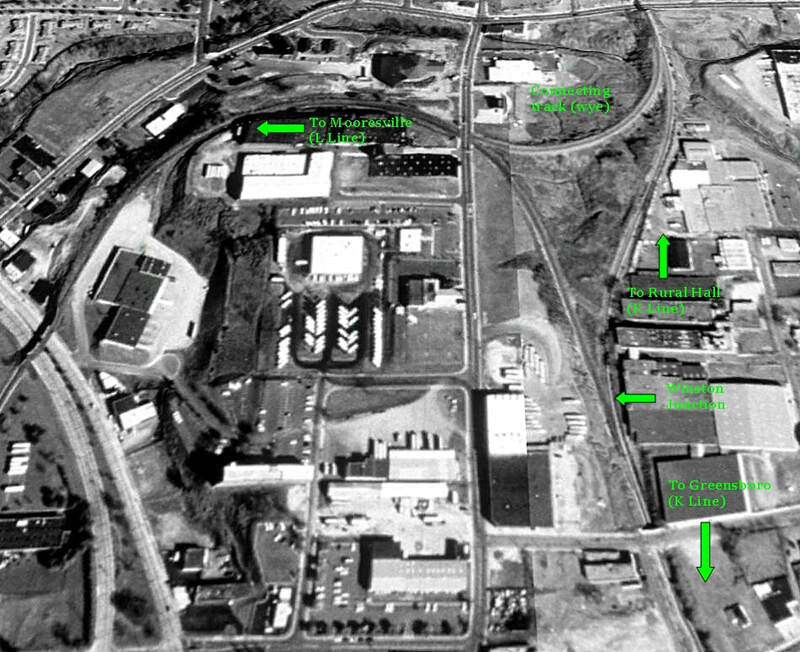 A 1993 aerial view of Winston Junction identifying the points at the location. The changes are drastic since 1917 with the transformation of residential to industrial districts and the expansion of the roads and highway system. Winston Junction in its prime was a busy spot and especially when passenger train traffic was in full bloom. Trains to and from locations such Mount Airy, North Wilkesboro, Greensboro, Mooresville, and Charlotte as well as points within passed and beyond through this junction. After the dissipation of the passenger train, freight volumes remained steady as to include local traffic which served the industries on both the K and L Lines. This activity remained in earnest until the 1980s when changing traffic patterns altered volumes and particularly in regards to the L Line. A visit to Winston Junction today is sobering revelation of change. Although there is refurbishment of some industrial structures in the vicinity, the railroad itself is ghostly shell of its former self. It is a junction in name only---the connection is removed--- as it begins a nine mile trek south through the city rusted and out of service. As it is, trains north and south on the K Line through here represent the only live railroad here today. From the junction the L Line enters a broad sweeping turn as it turns toward the south. Old industry occupied the area extending to North Cherry Street. 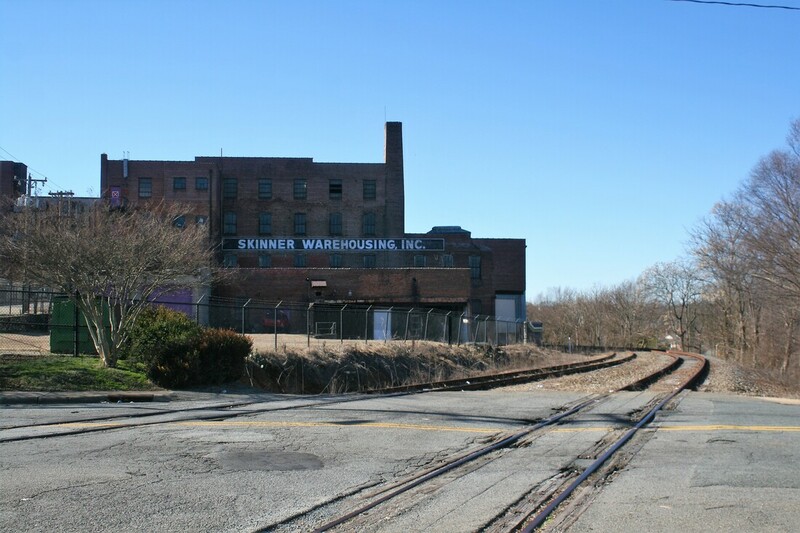 The Carolina Leaf Company located a tobacco warehouse here that now houses Skinner Warehousing and Phoenix Packaging. Bordering North Cherry Street is the Vernon Produce Company that once used rail service. The remains of a spur on a coal trestle still parallel the track here as well. An exploration of the L Line in Winston Salem is a sampling of the old and new. Vestiges can be found of the industrial past along the railroad that harken to the city past in its tobacco and textile roots. Yet amidst this setting is a contemporary city that has progressed into the 21st century with a vibrancy that embraces the present. The ultimate dichotomy of past and present can be found along South Stratford Road—extensive modern commercial development traversed by a rusty out of service railroad that exists as an anomaly from another time. It is ironic also in the respect that the greatest urban expanse along this rail corridor is dormant whereas the line remains active in areas that are remote. A note of prudence: For any with a curiosity for exploring the out of service sector L Line in Winston Salem, it is recommended that this not be done solo. It is a high traffic volume region and there are areas that are suspect with regards to personal safety. This is generally a rule of thumb in any large urban areas. ​An inconclusive listing of shippers from long ago would include the Export Leaf Tobacco Company, Farmers Union, Chatham Manufacturing, Hanes Dye and Finishing Company, Pine Hall Brick and Pipe Company. This group is among the largest of the businesses that evolved along the railroad but in addition, smaller customers also existed throughout the course of time that have long since vanished. As Winston Salem continued its southward expansion along US Highway 158 (Stratford Road), the region developed with newer industry of which utilized rail service. The bulk of this growth occurred during the immediate postwar era extending to the 1970s. Moreover, newer companies moved into older buildings near city center vacated by former shippers. These newer firms in some instances did not use rail service which is reflected by dilapidated spurs beside the respective properties. Determining the lineage of companies throughout the years that occupied these buildings can prove a tough undertaking. 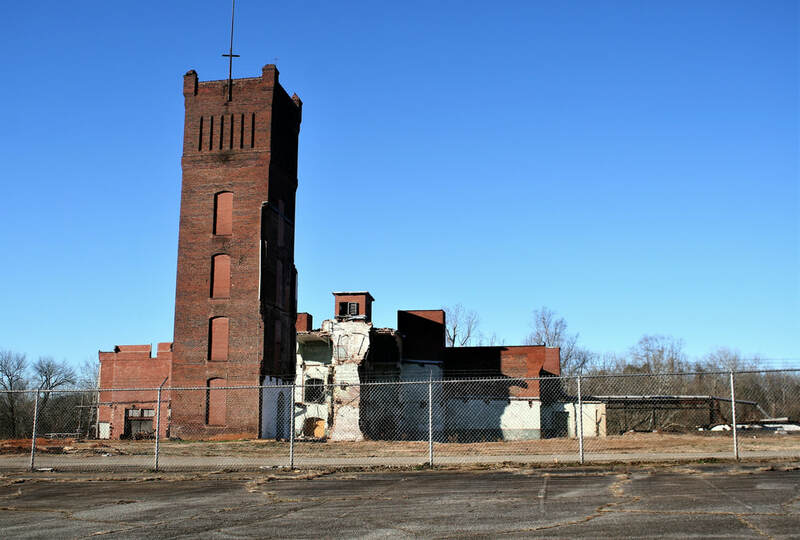 ​The largest of the early shippers at Winston Salem was the Chatham Manufacturing Mill. 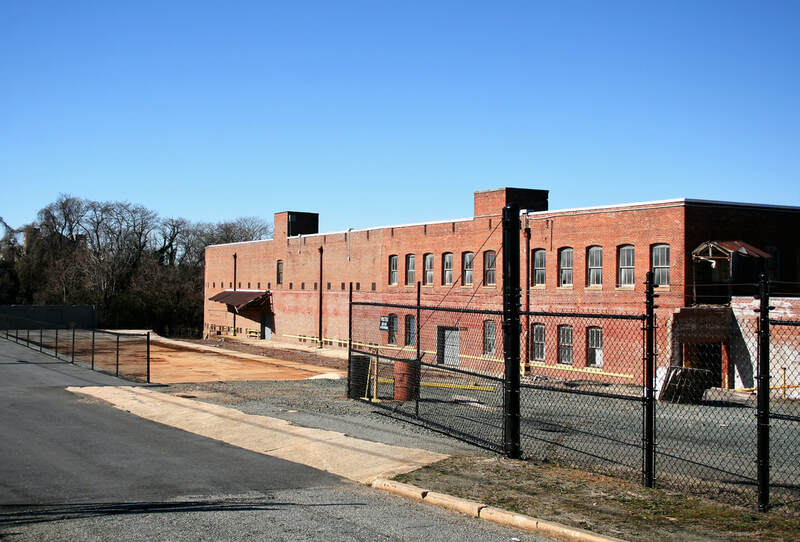 It was first established in the 1860s as the Elkin Mills but 1907, a new factory building was constructed along the L Line adjacent to Peters Creek. As the business grew, the facility expanded with the additional buildings and facilities. 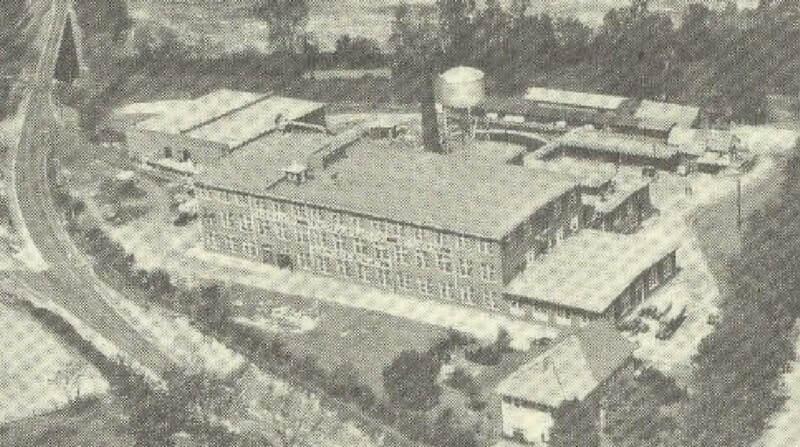 This location remained in operation until 1940 when the Chatham Manufacturing Company consolidated its operations at Elkin. Subsequently, the building was purchased by the United States government and occupied by the National Carbon Company during the World War II years. After the war, Western Electric occupied the building for two decades ending in 1966. The complex in recent years has been converted into residential apartments and exists by the name of Mill 800. 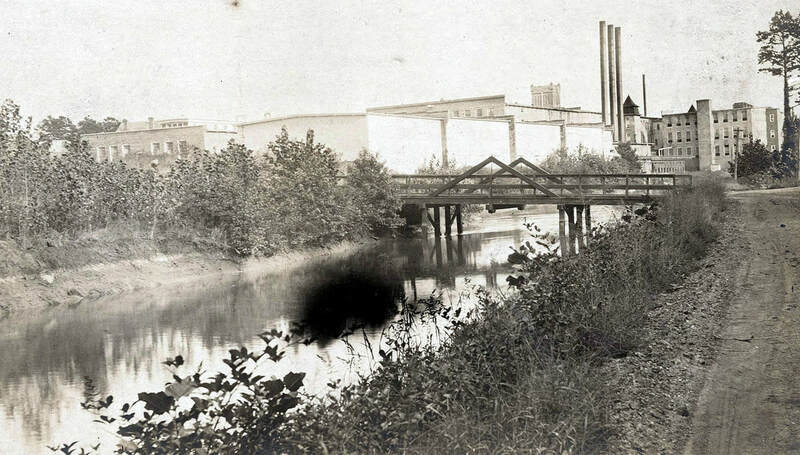 ​In 1924, the Hanes Dye and Finishing Company constructed a large plant along the railroad at Northwest Boulevard. As a subsidiary of Hanes Companies, this operation specialized in the production of topical additions to fabric such as waterproofing and fire retardation. It remains in business today as Hanes Geo Components; however, it is without rail service as it is situated on the out of service sector of the line. Chatham Mills was a prominent early shipper on the route heading south from Winston Junction. This firm remained in business until 1940. An observation about several bridges and trestles on the L Line. Though visually interesting using combination wood/steel design in specific applications, they are lower tonnage structures than solid steel construction. To an extent, it is a moot point. They have fulfilled their purpose for years and now do so with decreased traffic levels. 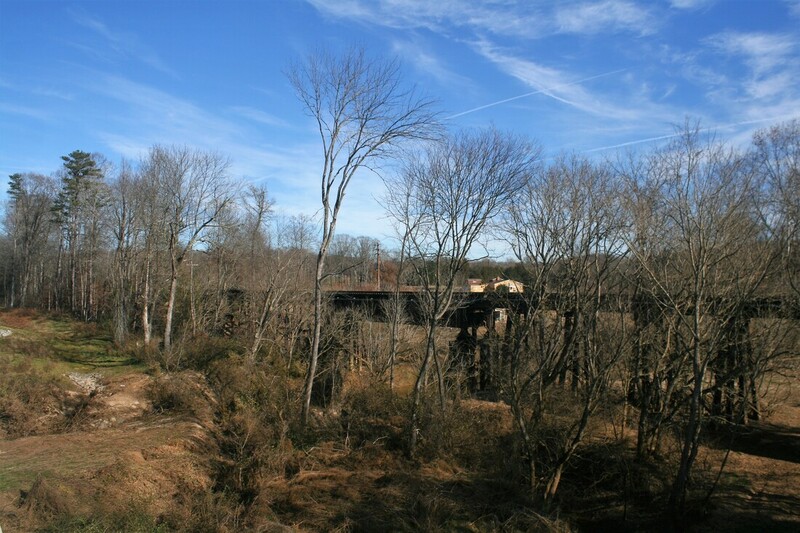 One notable exception is the Peters Creek trestle adjacent to the old Chatham Manufacturing Mill. That this structure was never replaced years ago with an upgraded bridge is a mystery. It looks frail and how it withstood the weight of traffic for as long as it did is remarkable. 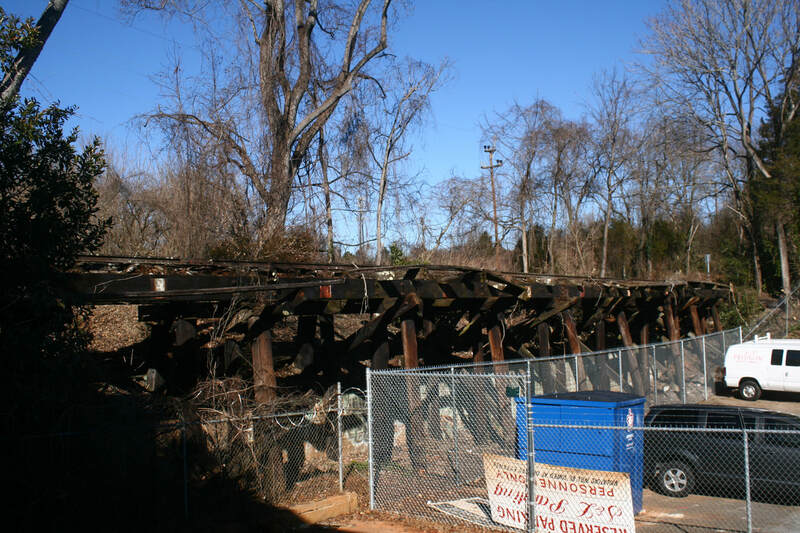 But the old wooden trestle was ultimately condemned during the 1990s and closed to traffic resulting in the end of service on the L Line at Winston Salem. Whether the remaining shippers there disappeared as a result of the embargo--or, vanished prior to--- reinforced the Norfolk Southern decision to not repair / replace the trestle. One certainty is that it rendered the railroad as no longer operationally contiguous from Winston Salem to Mooresville. Obviously, NS does not justify the expense of addressing the Peters Creek trestle opting instead to serve nearby Clemmons from Barber. The Farmers Union Agency was a small shipper along the line during the early 1900s. This map area has undergone significant transformation a century later and the business disappeared into oblivion long ago. 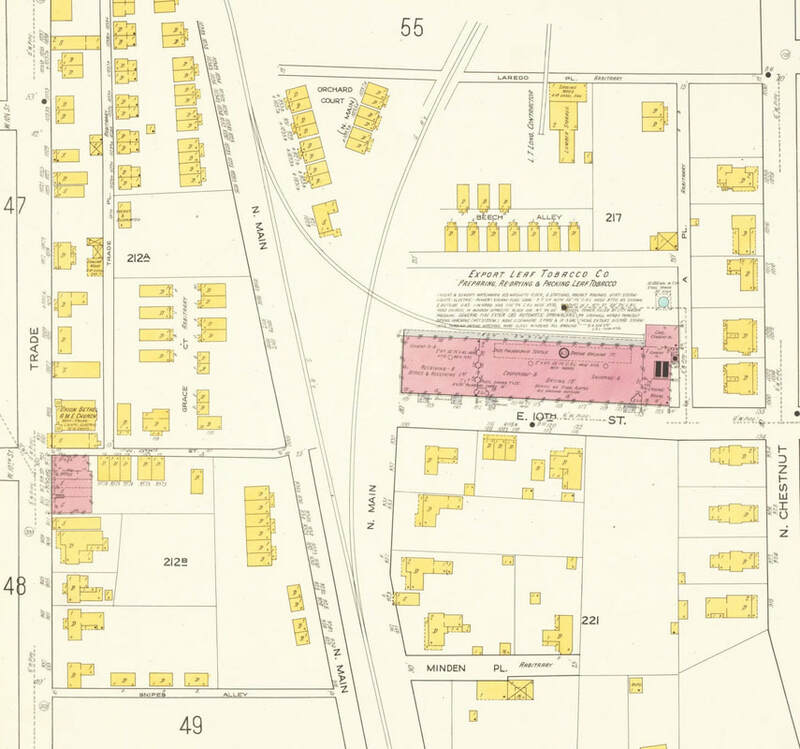 The area adjacent to Northwest Boulevard was a small industrial pocket in years gone by. The railroad fits tightly here between the business district and higher ground that is prevalent here. Shippers such as the Piedmont Leaf Company (one location), the Farmers Union, and the Pine Hall Brick and Pipe Company were located along this stretch. The remnant of a long siding still exists here as to include a dilapidated coal trestle. Exploring the L Line south through Winston Salem adjacent to Stratford Road is a step into a vortex to a generation ago. The railroad right of way looks as it did nearly three decades ago aside from the track condition itself. Deep rust has engrossed the rails and many a tie possess a bleached white pallor from decay. What separates the present from the past, though, are the changes that have transpired around it. A commercial district of modern shopping malls, restaurants, and office buildings flank both sides of the railroad creating an ironic contrast. All has progressed but for the railroad itself which stands out like an element from another place and time. Evidence exists of rail shippers from the distant past. Spurs that served buildings that long since changed owners or were taken by modern development remain. Only at one location can a former shipper be seen as it was in yesteryear---the concrete/limestone plant at the present day North State Industrial Park. The 1020 foot passing siding at the rail name of Frontis is still intact but without a need. 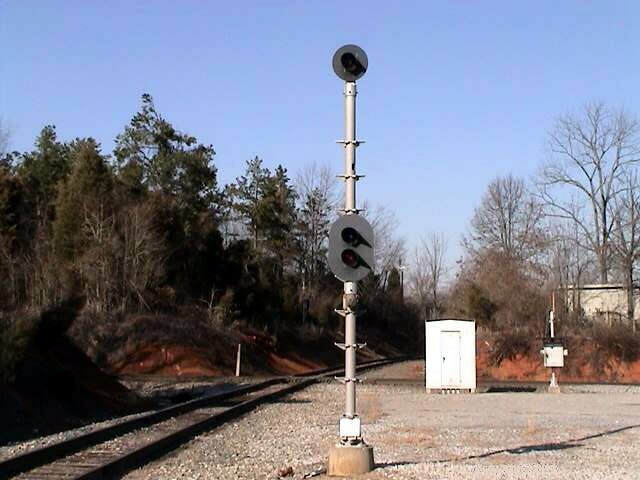 Grade crossing flashers still stand but with signals turned to indicate out of service status. In essence, a frozen past embedded into the hectic progression of today. 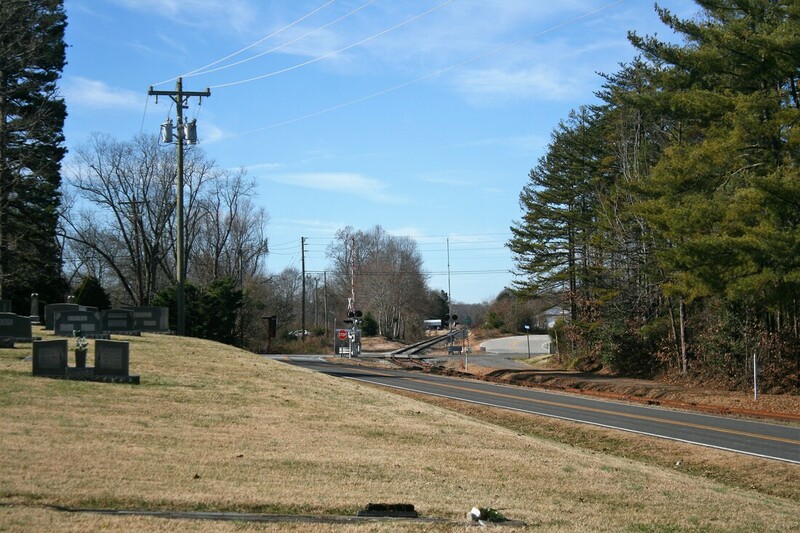 Clemmons is representative of a community that is distinctly old and new. 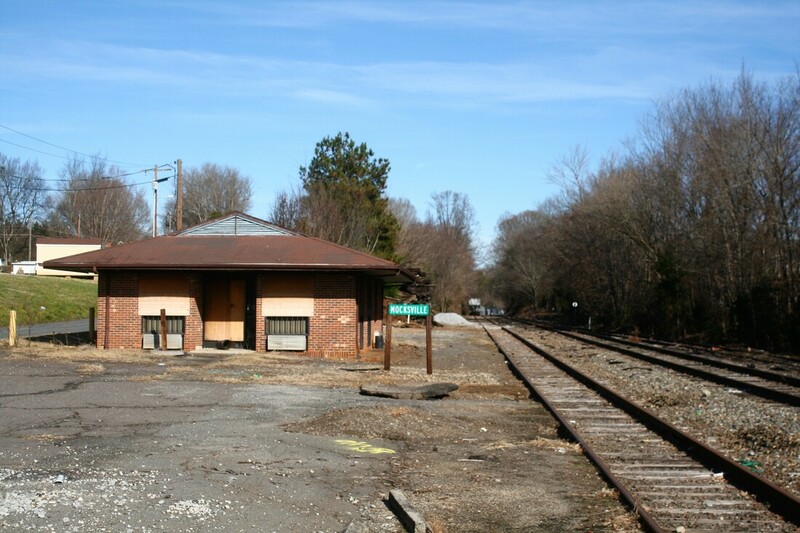 The original section of the town established along the rails of the North Carolina Midland Railroad as it was constructed from Winston Salem to Mocksville. Primarily agrarian in nature, industry did develop in the later years of the Southern Railway. It was a scheduled stop for the passenger trains of the day providing transport into Winston Salem or to and from points south. During the past two decades, the region has exploded with urban growth. As a bedroom community for Winston Salem, residential areas have expanded exponentially and now envelop the older district near the railroad. In essence, a new town has evolved centered around Interstate 40 and US Highway 158. Activity remains, however, along the railroad with industry dependent on the rails. The largest—and northernmost shipper now on the L Line---is the Triangle Warehouse and Distribution Center that receives a quantity of boxcars. Near the old town center is Poindexter Lumber of which a rail spur still serves. 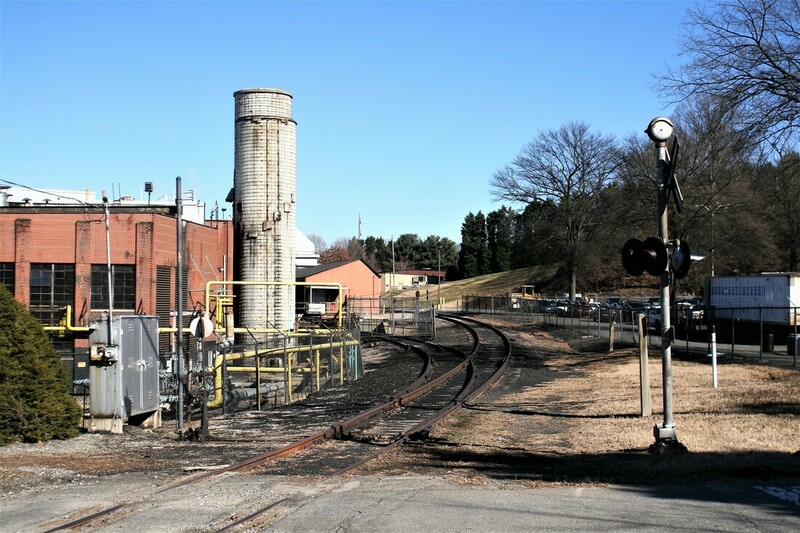 To facilitate all the switching moves at Clemmons is an important 1320 foot passing track that enables power to runaround train for the return to Barber. 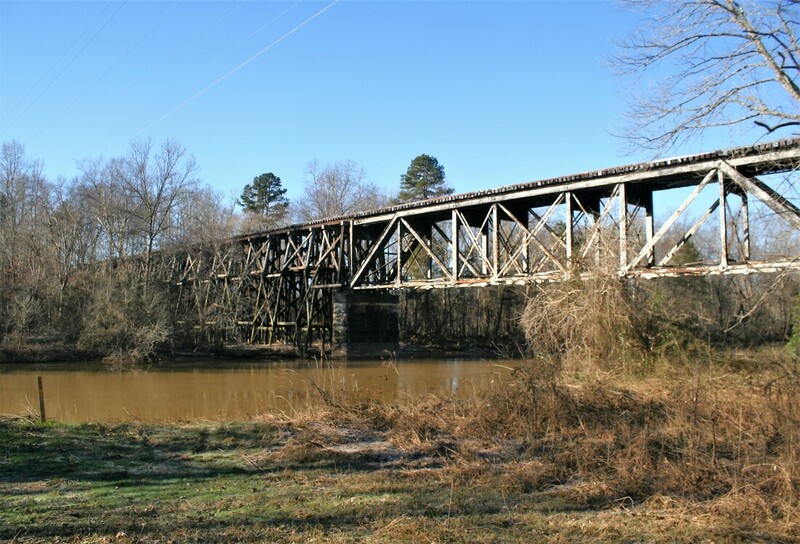 South of Clemmons, the railroad crosses the Yadkin River and the mouth of Carters Creek on the most impressive bridge that exists on the L Line. The 1040 foot span is a unique structure— steel decking with stone arch spandrels at each end and at mid span. Below it is the Idols Dam forming a reservoir by the same name in the river. Aerial view of the Idols Dam and Reservoir on the Yadkin River south of Clemmons. The railroad bridge is the greatest in length on the L Line and consists of steel decking and stone arching. Future plans include incorporating personal photos of this structure to insert here. 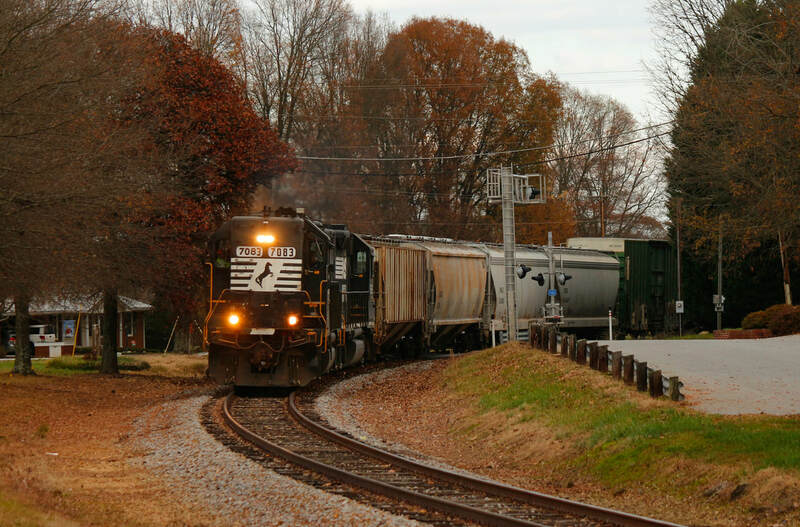 Advance is the center of the rural region along the railroad in the sector between Clemmons and Mocksville. Its major prominence was that of a scheduled passenger train stop and as a shipping point for agriculture that defined this sector of the L Line in bygone years. It, like Clemmons to the north, has developed in modern times as a residential suburb of Winston Salem with commercial growth as a complement. 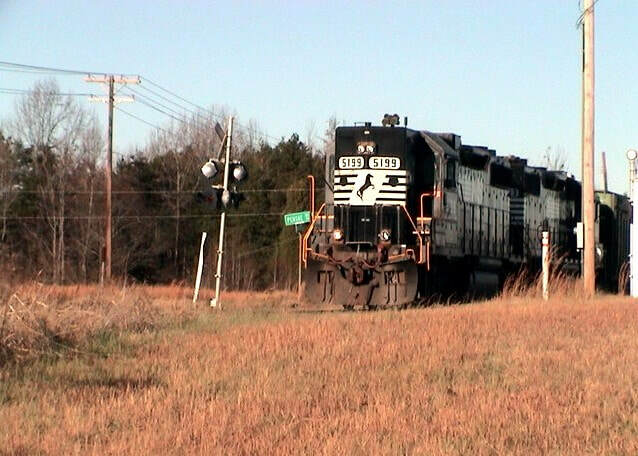 This “newer” Advance is removed from the railroad; instead, it is situated along US Highway 158 and Interstate 40. 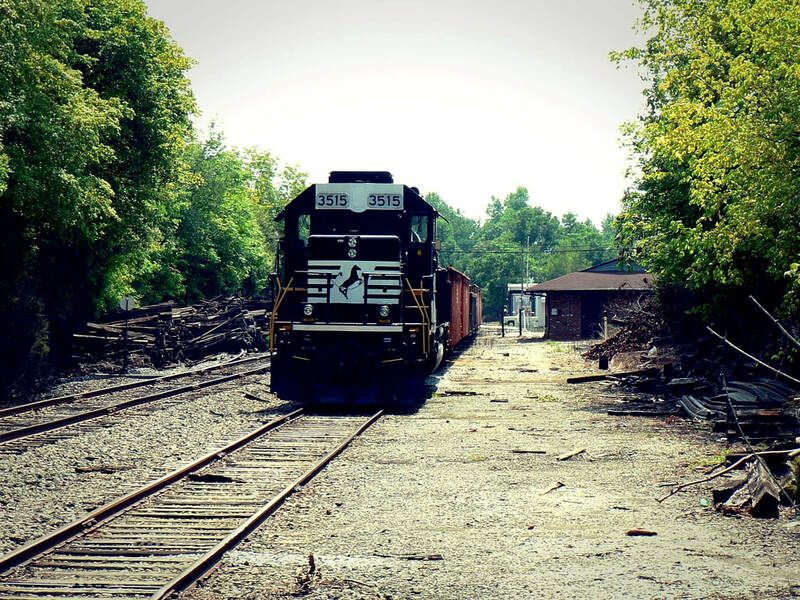 There are no contemporary industries that ship by rail at Advance but its trackside appeal lies in the access to the railroad that is available. Photographers hoping to capture images of P25 here can choose from various locations in generally favorable light conditions. Google Earth view of the area south of Advance centered at Bixby. During the early 1960s, a 2.5 mile spur was built to serve an RJ Reynolds plant also under construction. 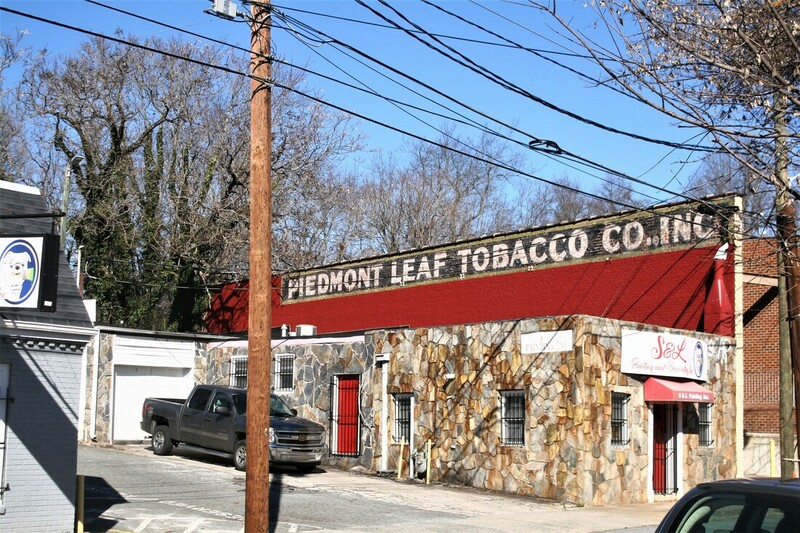 It remained active until the 1980s when the tobacco giant vacated this location. The spur has since been removed and an Ashley Furniture distribution center occupies the site today. South of Advance is a crossroads known as Bixby. This small community was a flag passenger train stop during those years centered in an agricultural region marked by farms and meadows. 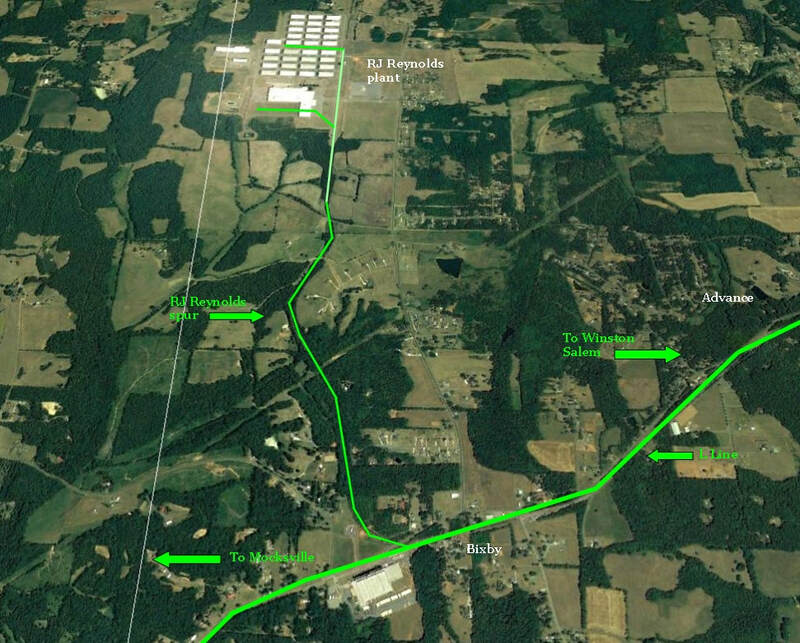 In 1963, RJ Reynolds purchased a tract of land to the west of the railroad to construct a facility. To serve this business, a 2.5 spur was extended from the L Line at Bixby to the site. A 1300 foot passing siding/runaround track was located here and used to facilitate switching moves. According to a local resident at Bixby, the RJ Reynolds operation there remained active until the 1980s. The 2.5 mile spur remained until circa 2000 when it was eventually pulled up. Ashley Furniture now operates a distribution warehouse at the former RJ Reynolds facility. Ironically, Ashley Furniture is a large rail shipper although it is by means of intermodal movements. 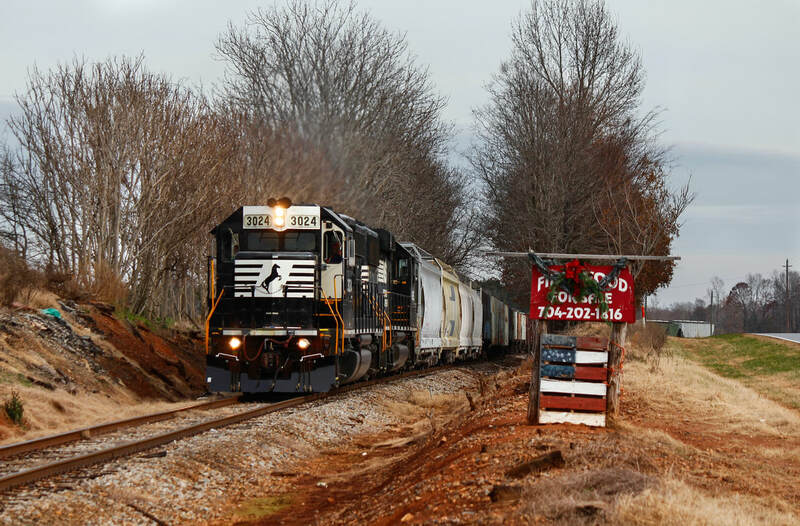 As the railroad continues south from Bixby, it passes through another rural community known as Cornatzer which was also a flag passenger train stop in days gone by. 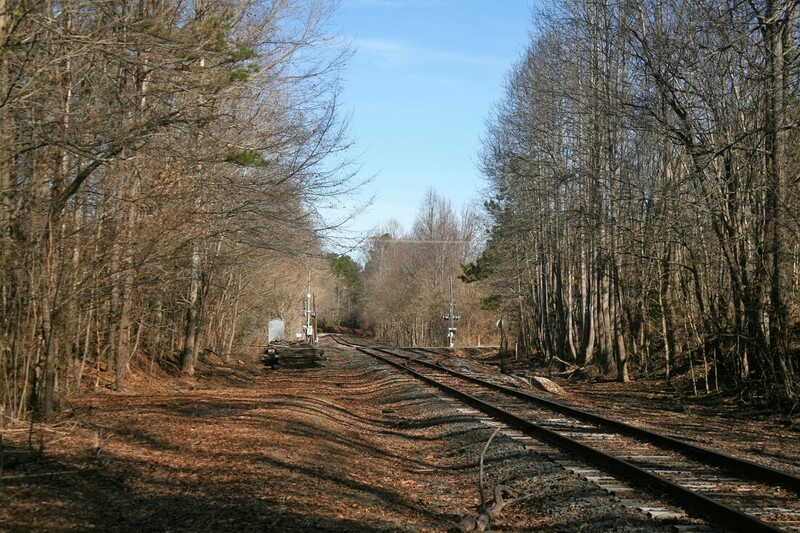 The terrain from here to the outskirts of Mocksville is dense woodlands with occasional meadows and within this area the railroad crosses Buffalo Creek with a 750 foot bridge then Elisha Creek on a 300 foot span. 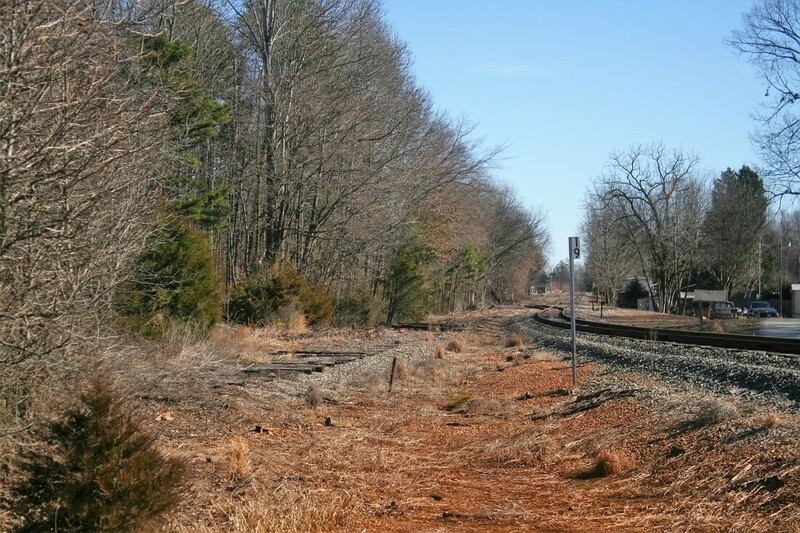 Most of the area between Cornatzer and Mocksville along the railroad is privately owned and generally inaccessible. ​The arrival of the North Carolina Midland Railroad at Mocksville in 1891 was welcomed with great fanfare. 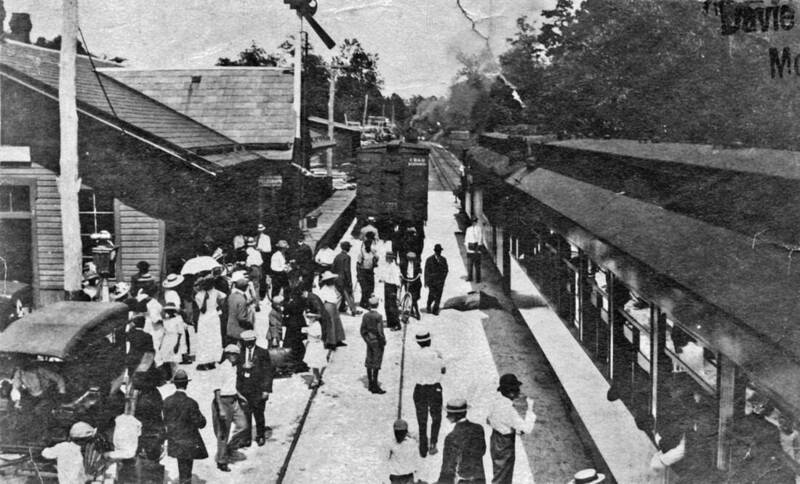 Citizens of Davie County were finally connected to the rail network with a direct and expedient link to Winston Salem and beyond. Economic development ensued with the establishment of industry and specifically in relation to an agriculturally based region. 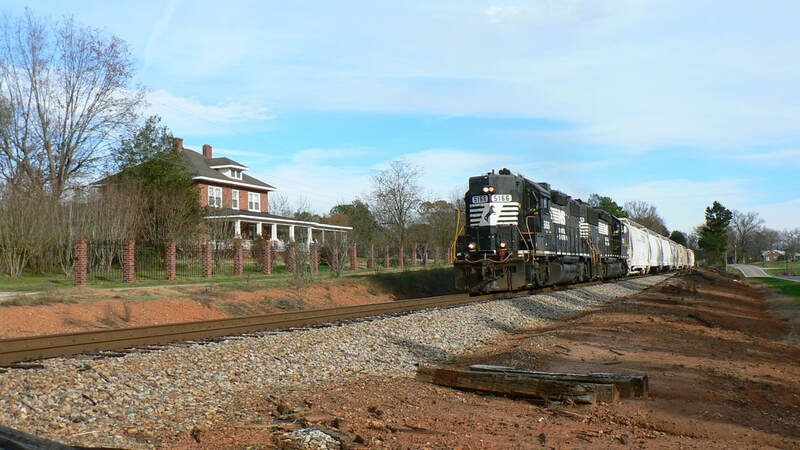 ​For seven years, Mocksville was the terminus of the railroad extending from Winston Salem touching Clemmons and Advance en route. Although this sufficed for the county seat of Davie County and the immediate area, the long sought hope was to extend the railroad south. In 1894, the Southern Railway was formed and it had acquired the properties of the North Carolina Midland Railroad and its successor Richmond and Danville Railroad. 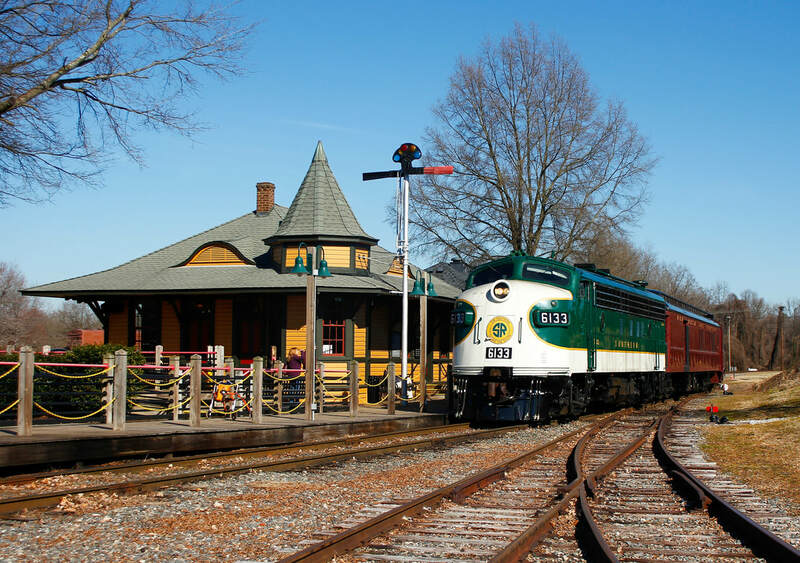 As part of the great rail expansion of the era, the Southern Railway in 1898 began construction of the railroad extending south from Mocksville to Mooresville and a junction there with the AT&O. 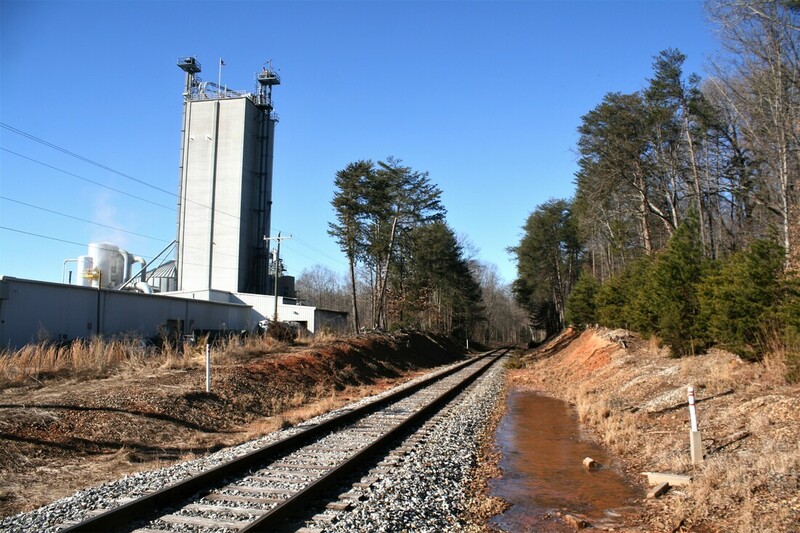 Mocksville and Davie County now had direct rail access south with a corridor directly to Charlotte. ​​Among the businesses to establish rail service during the early 1900s were J.P Green Milling and Hanes Furniture. In the town center railroad district at Depot Street, a facility was constructed that featured a watering trough for livestock as it passed through by rail. 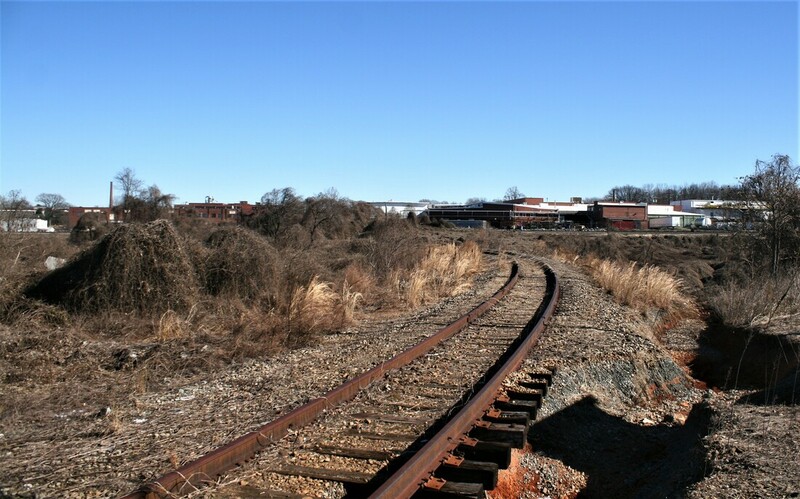 Although the furniture business is gone, the rail siding remains however in decrepit condition. The livestock facility, of course, disappeared during the first half of the century. J.P Green Milling is a community landmark and remains in business today as a family owned enterprise. Its rail siding is intact but has not received a railcar since the early 2000s. Another business (or predecessor) that utilized rail service is at Caudell True Value Lumber at the north end of the old business district. Contemporary times witnessed the development of newer industry at Mocksville such as Funder America, Carolina Precision Machining, Avgol, CPP Global and the Reeb Millwork Corporation. 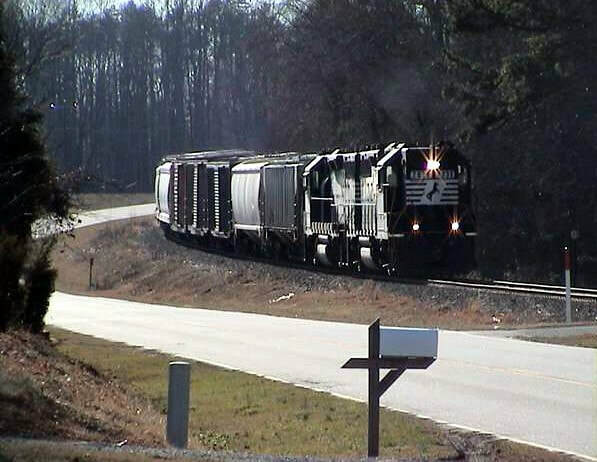 The influx of this modern railroad business created the greatest number of shippers along the L Line at Mocksville with Avgol among the greatest volume in carloads on the entire route. 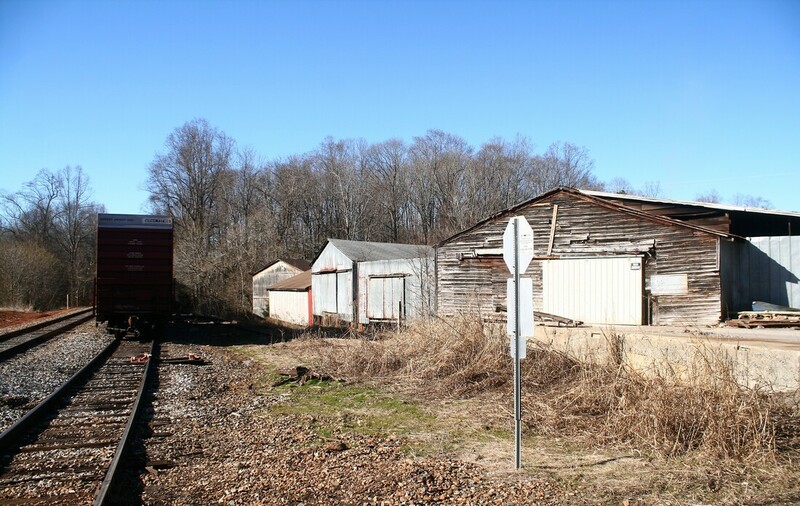 In 1985, the original Mocksville depot was removed and relocated off site. As a replacement, the Southern Railway constructed a brick building to serve as a crew and yard office as needed. Use of this building was discontinued and has since been boarded up. The location remains busy, nevertheless—railcars to and from regional industry are staged here utilizing the 3800 foot passing siding for storage. During the week, the work at Mocksville can account for bulk of P25s workday. It is also occasionally used as staging location for maintenance of way trains working the L Line. South of the Avgol plant, the railroad enters a remote region that extends to Cooleemee that is inaccessible by public means. Private land marked by wooded areas and pastures border the railroad between the two points. During the era of the great industrial expansion, towns appeared on the landscape with the arrival of the railroad. Often, one primary industry would emerge as the economic lifeblood of the community as the township developed around it. In the South, examples readily abound and especially in pertinence to textiles. The Piedmont region of North Carolina thrived in this existence for a century and in essence, communities that depended on this sustenance lived and died by it. As the textile industry dissipated during the late 20th century, it left in its wake towns stripped of an economic stalwart. Cooleemee is a quintessential example of this story repeated elsewhere many times over. Google Earth view of Cooleemee and its relationship to the L Line. At Cooleemee Junction, a two mile spur diverged from the main that paralleled the South Yadkin River to serve Erwin Mills. Although the mill was closed in 1969, the spur was not removed until the 1980s. 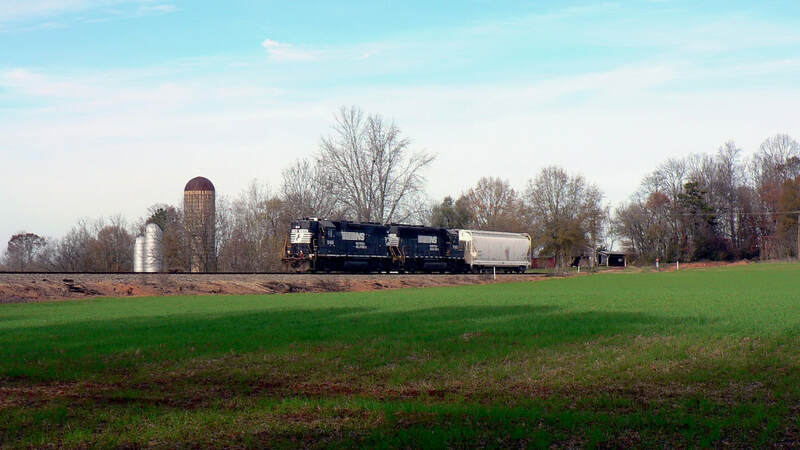 As the railroad expansion continued south from Mocksville in 1898, it passed the Shoals of the South Yadkin River. Once a location for industry during the antebellum period of the 1850s, it underwent a renaissance with the coming of the iron horse. 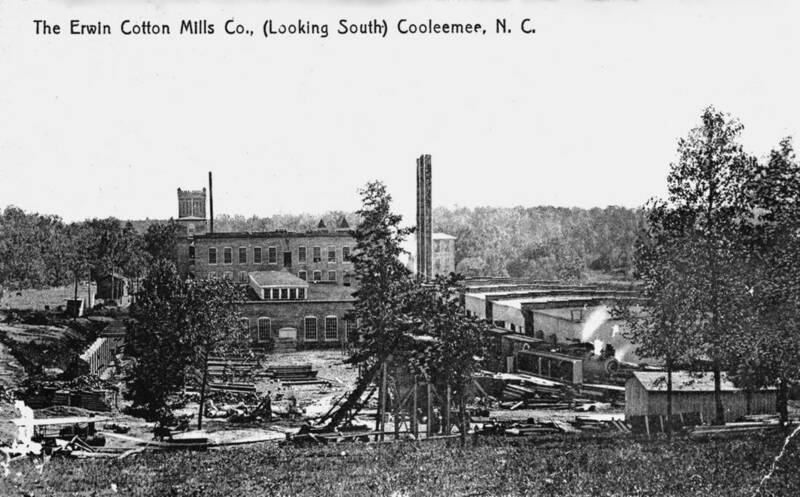 In 1899, the realization came to fruition when Benjamin Newton Duke and William Allen Erwin backed the construction of the Cooleemee Power, Water and Construction Company. 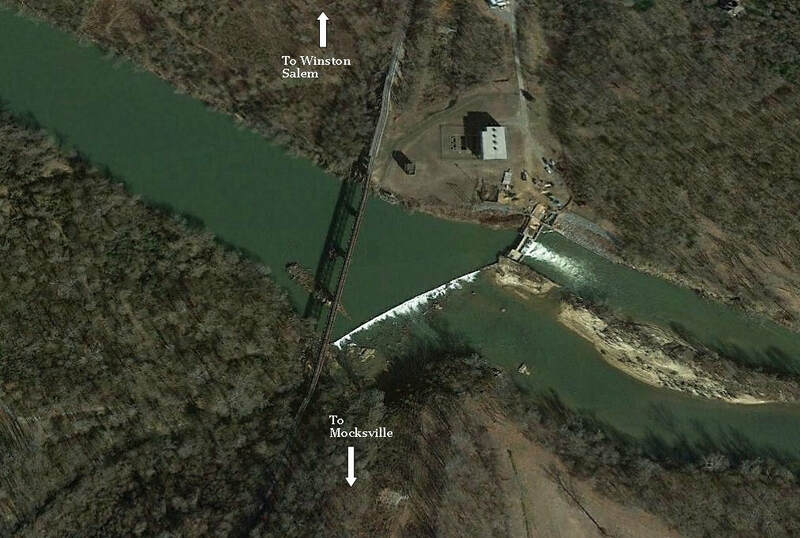 The river was also dammed at the shoals to generate water power for the mill and community. 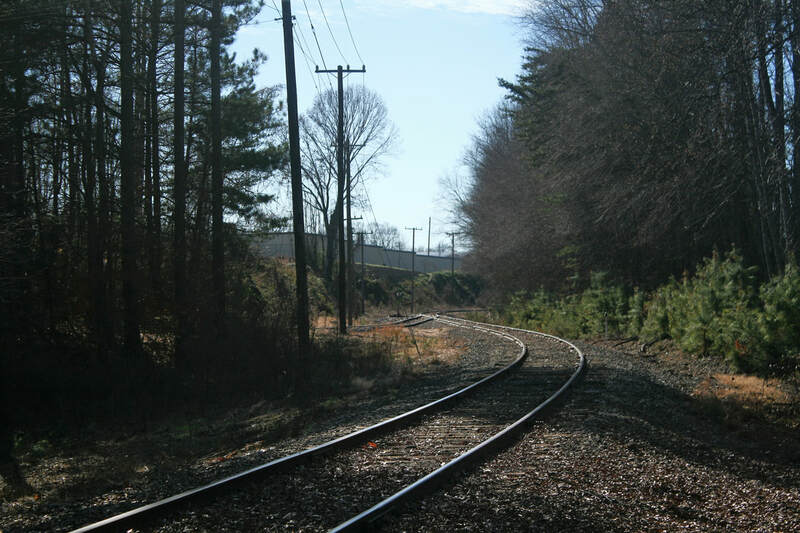 A two mile long spur was constructed from the railroad at what would become Cooleemee Junction to the site of the mill which paralleled the north bank of the South Yadkin River. At the mill the spur diverged as two tracks---one for hopper cars of coal and the other to a depot which received raw material and shipped out finished goods. For the first seven years of its existence the plant was known as the Cooleemee Cotton Mills. As with many emerging textile mills at the turn of the century, villages were constructed in proximity to house the workers and provide amenities such as small supporting businesses. The village at Cooleemee actually commenced before the mill construction was complete. During the period of 1898-1912, houses emerged on the landscape as quickly as mushrooms sprouting from the forest floor. A visit through Cooleemee today will reveal that the nearly all of these structures remain extant. 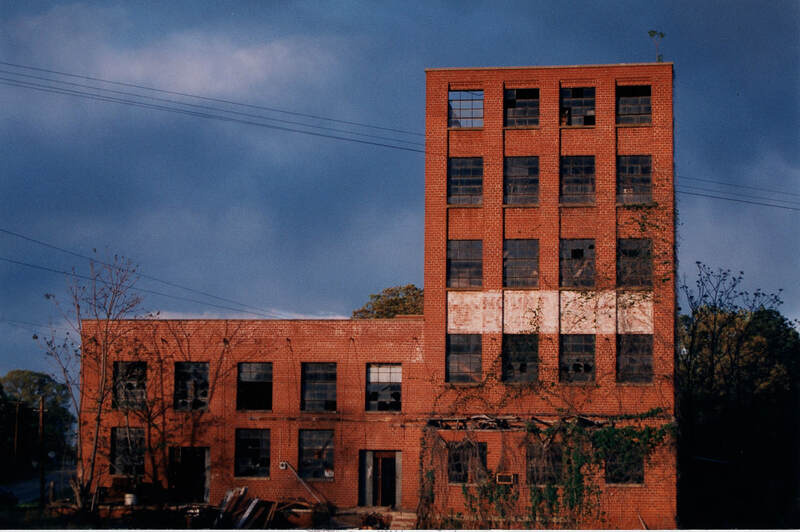 In 1906, the mill was renamed the Erwin Cotton Mill #3 and during its early years its primary products were flannels, covert cloth, and mattress tickings for export. 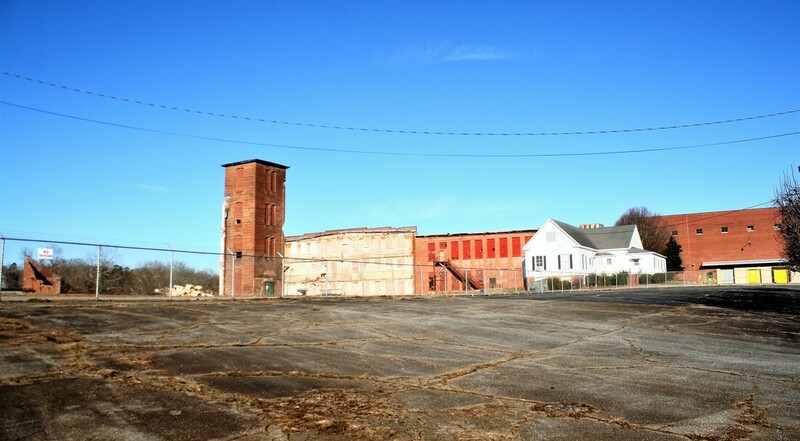 A 1908 fire destroyed a section of the mill in addition to its roof halting production but otherwise, the operation continued its growth with accompanying expansions into the 1960s. 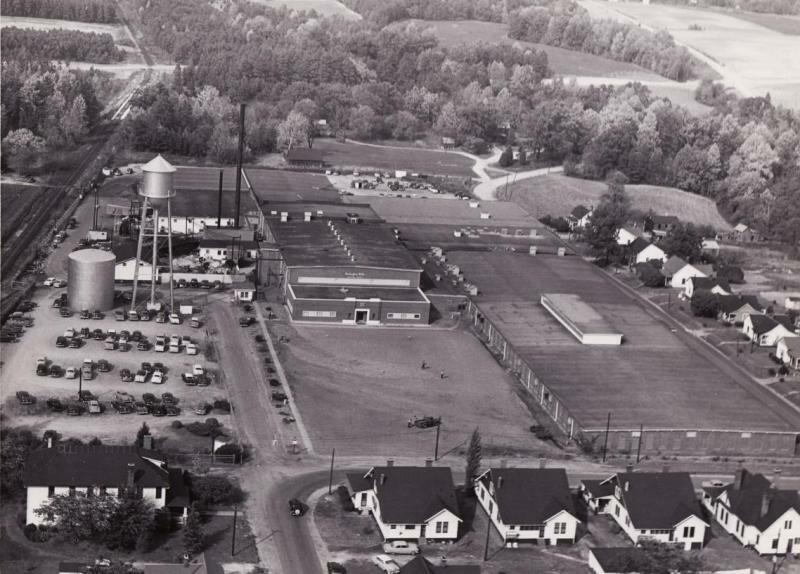 In 1962, the Erwin Cotton Mill #3 plant was purchased by Burlington Industries and remained in business until its shutdown in 1969. Its closure devastated the Cooleemee region with loss of jobs---for many years, it had been the largest employer in Davie County. As of this writing, the original section of the Erwin Mills has been in a state of demolition but other supporting structures remain. ​For seventy years, the mill also generated revenue for the Southern Railway. Shipments of coal and boxcars with raw and finished goods accounted for enumerable carloads until 1969. When the mill closed, the spur was left in place but since no successive suitors developed, it was removed during the 1980s. A 2400 foot passing siding once used to accommodate switching moves remains at Cooleemee Junction but to a great extent, now without a purpose. The contemporary railroad scene consists of NS P25 passing through the sleepy Cooleemee community in the shadowed memory of a long ago perished mill and no present day shippers. 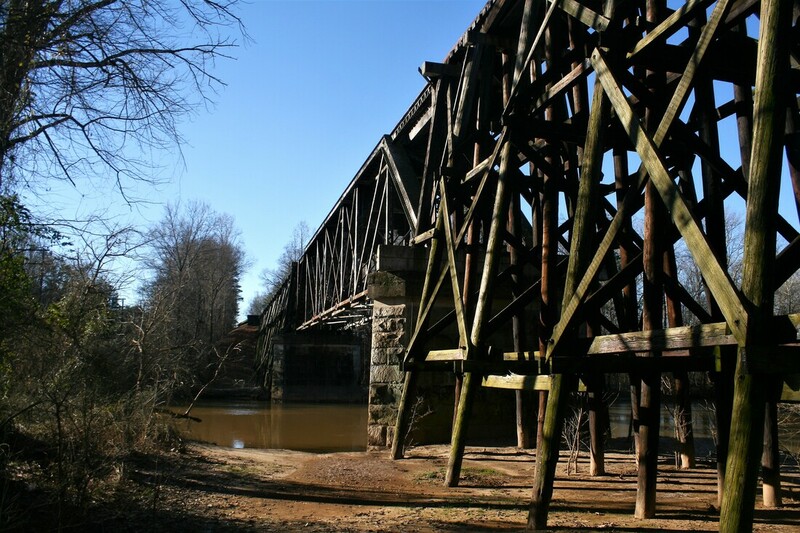 ​Past the location of the former spur that served Erwin Mills, the railroad crosses the South Yadkin River on a 600 foot combination trestle/deck bridge. On the opposite bank begins a heavily wooded region that extends into the Woodleaf area that is inaccessible but for the area at Needmore Road. Continuing south, the right of way passes through dense growth with two stream crossings within 400 feet of each other. The first is another crossing of the South Yadkin River on a 270 foot bridge and immediately south, a 250 foot bridge spans Third Creek. Shortly beyond the double bridges, the railroad crosses Cool Springs Road emerging into an open area bounded by the Woodleaf rock quarry. In 1924, excavation began at the newly formed Martin Marietta Quarry (Aggregates) at Woodleaf. 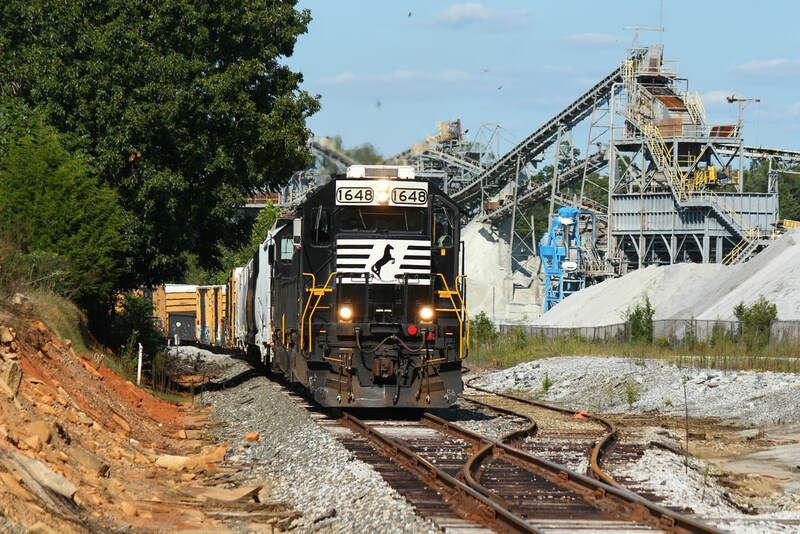 One of several granite quarries that operate in North Carolina, it has also been a shipper on the railroad. 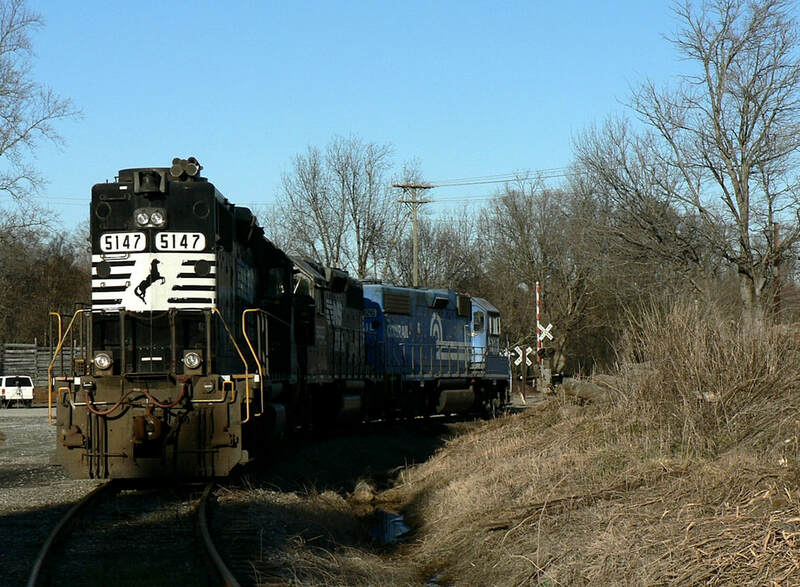 For many years, it provided ballast for the Southern Railway continuing into the Norfolk Southern era. Sporadic loading continue into the present day. 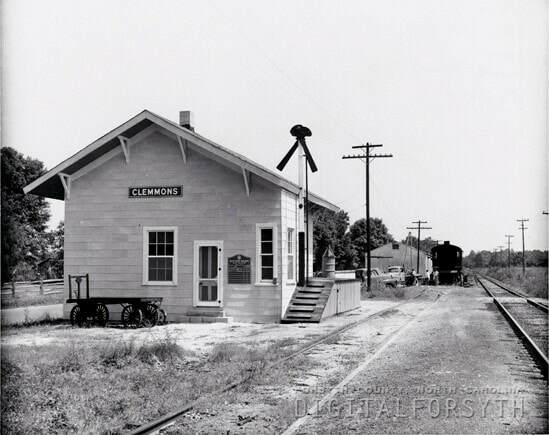 Woodleaf was also scheduled passenger train stop in bygone years. The landscape south of the quarry is defined by bordering farmland and pastures broken by stands of trees. This region offers a serene setting for photographers in search of P25 passing through the rural yet extended community. Google Earth view of the junction of the NS L and S Lines at Barber. An active location for both lines, Barber serves as the operational base for traffic on the L Line in both directions. 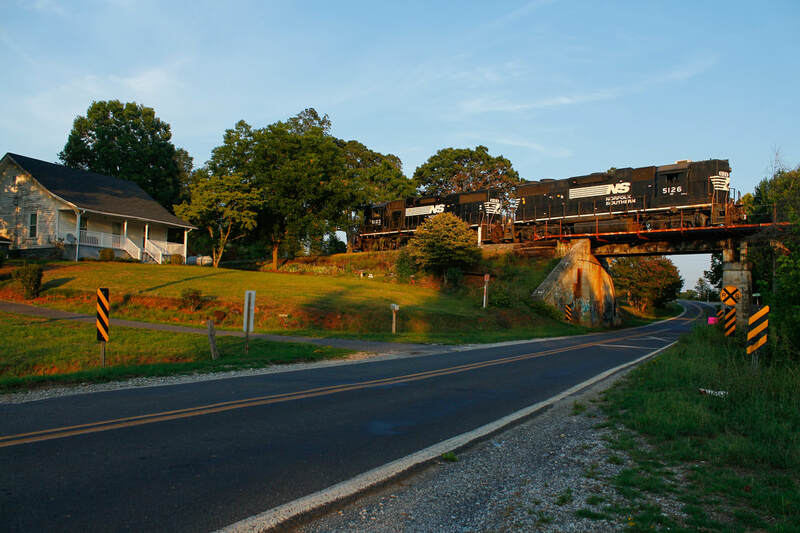 ​Barber was established as a railroad town with the arrival of the Western North Carolina Railroad by 1860. 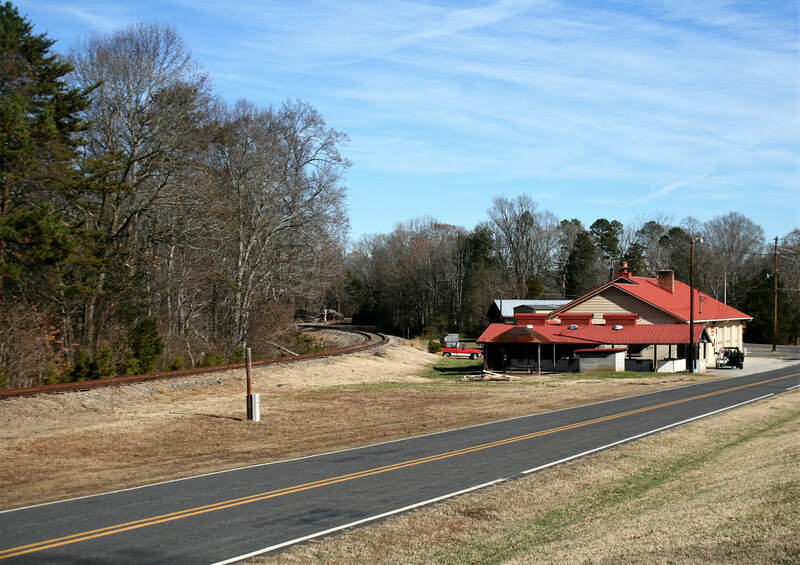 Situated on the expanding western route from Salisbury to Murphy, it was a rural stop along a line stretching through the Piedmont to the mountains to the west. After the Civil War in 1868, Barber was located in what became the Eastern Division of that line. For the next three decades it remained merely as whistle stop location on the route with no significant notoriety. 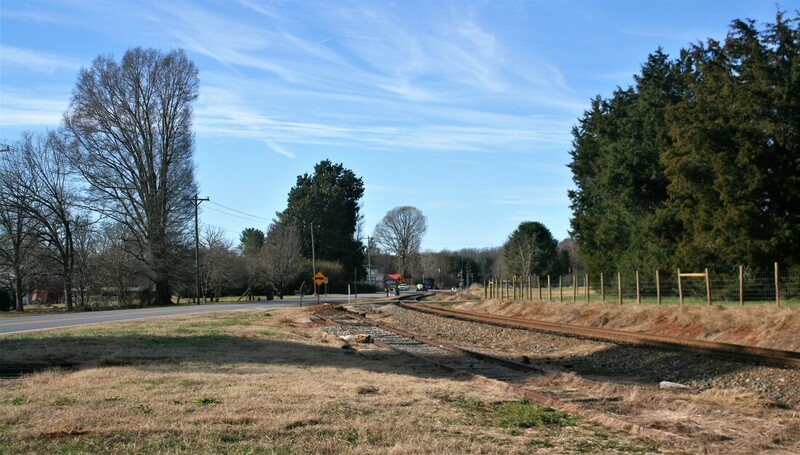 The expansion of the original North Carolina Midland Railroad from Mocksville to Mooresville in 1898 resulted in that line passing through Barber thereby creating a junction of east/west and north/south routes. Upon the completion of the intersecting lines, Barber immediately rose in prominence as a focal point during the early Southern Railway years. 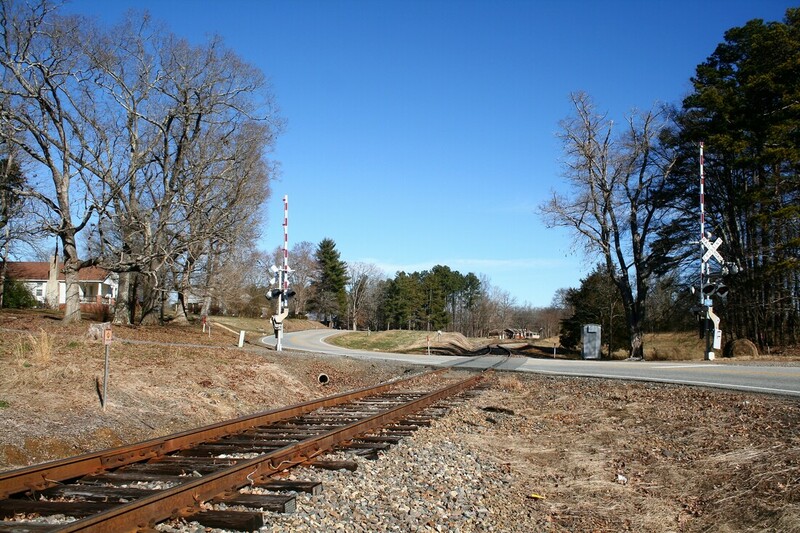 Just as the AT&O had achieved the creation of a junction at Statesville to Charlotte from the Western North Carolina Railroad, Barber Junction as it was now called accomplished the same feat as a junction from that line (now Southern Railway) north to Winston Salem and south to Charlotte via the AT&O at Mooresville. Barber Junction became a primary point during the golden years of passenger trains as connection point for train changes in all four directions. Scheduled freight traffic passed through with trains bound for Charlotte or Winston Salem and, of course, those running east and west between Salisbury and Asheville on the route known as the S Line. Throughout its history lasting until the late 20th century, Barber was also frequented by local trains based from various locations switching industry in the region. 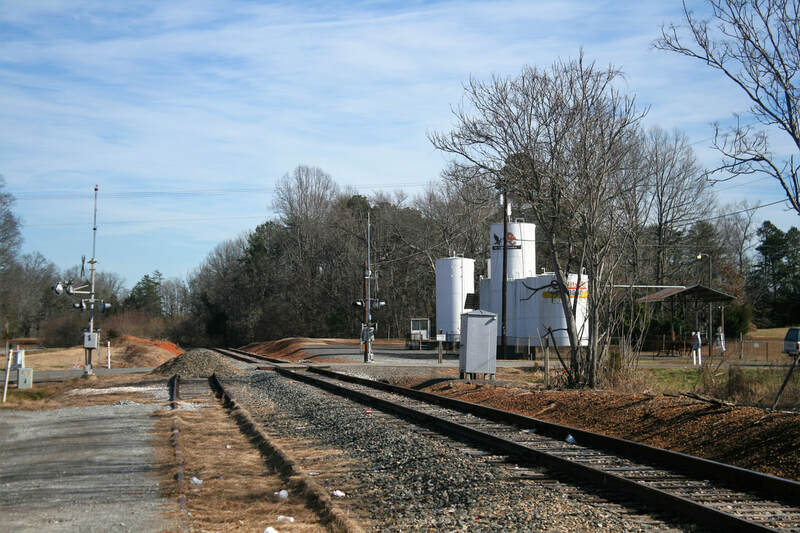 Beginning in the late 1970s, a series of events that would occur operationally initiated by the Southern Railway and its successor, Norfolk Southern, would impact the relevance of Barber Junction. 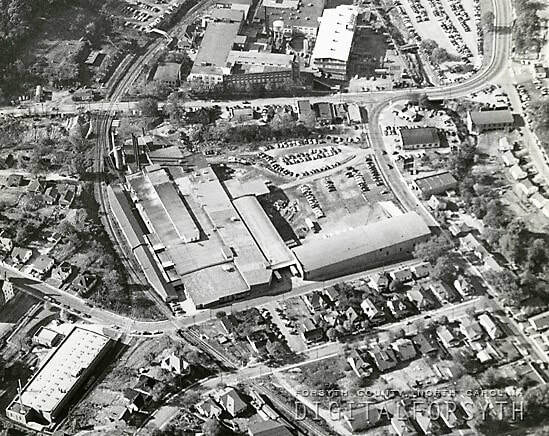 In 1979, Linwood Yard north of Spencer began operations that changed traffic patterns de-emphasizing through traffic on the L Line between Winston Salem that gradually dissipated over the course of time. 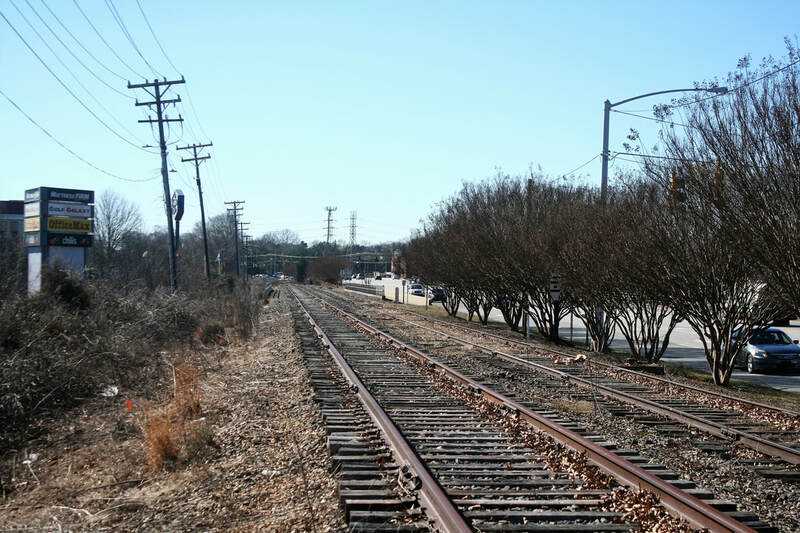 Initially, a new northeast connecting track had been installed at Barber which enabled traffic to diverge to and from Linwood on the L Line north to and from Winston Salem. Eventually, though, by the time of the Norfolk Southern merger in 1982, through traffic between the two points began exclusively funneling north to Greensboro then over the K Line to Winston Salem. 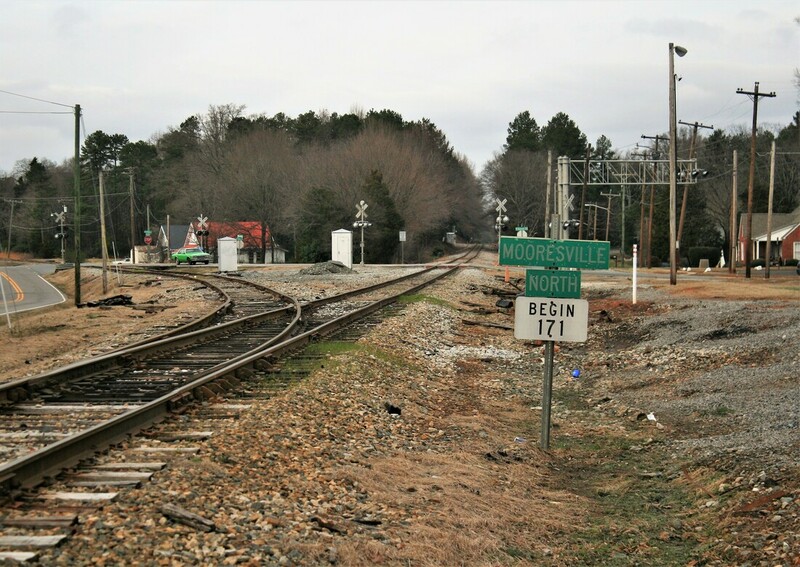 In 1983, a section of the AT&O route between Statesville and Mooresville was abandoned resulting in Mooresville service originating in Charlotte and remaining in effect until the early 2000s. 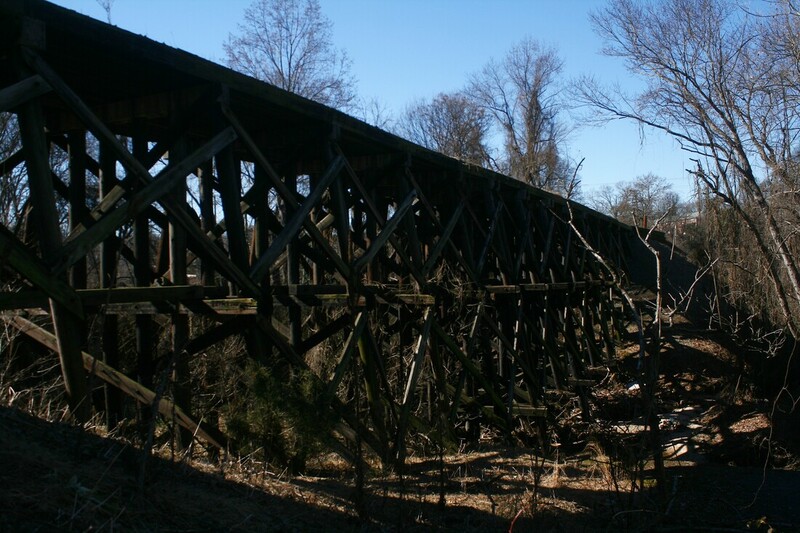 During the mid-1990s, the Peters Creek trestle in Winston Salem was condemned terminating service to and from the city on the L Line. All of these changes ultimately led to the redirection of Barber as an operational crux. For the past two decades, operations on the L Line have been based at Barber utilizing the movement of four assigned short distance trains with an occasional long distance manifest. P61 (new Linwood Yard-Barber assignment at the time of this writing) is the primary set off train for traffic to the L Line. Also at the time of this writing its counterpart, P60, (Hickory-Linwood Yard), has been recently abolished. P23 is the train that operates on the L Line from Barber to Mooresville and on the north end, P25 from Barber to Clemmons. Both P23 and P25 are turns and the only scheduled trains on the route generally operating on weekdays. It must be noted, however, that the railroad operations of today are in a constant state of flux with changes occurring frequently that can deem this information obsolete. With the cessation of passenger service, the Barber depot was without a purpose and it was replaced with a utilitarian brick office building. The original 1898 depot was disassembled and removed to Spencer where it was reassembled to its original state. In its reincarnation, it has resumed what it was intended for. Modern day passengers now board trains at the depot for excursion trips at the North Carolina Transportation Museum. Barber hosts a small yard for the transfer of cars between the L and S Lines and also hosts a large shipper. Southern States feed mill is served by a spur from the L Line between the junction and the bridge spanning US Highway 70. South of Barber, the railroad continues its trek through pastoral if not idyllic farm country occasionally interspersed with patches of woodlands. What it lacked in online industry was atoned for by a tranquil beauty spread abreast on a broad landscape. 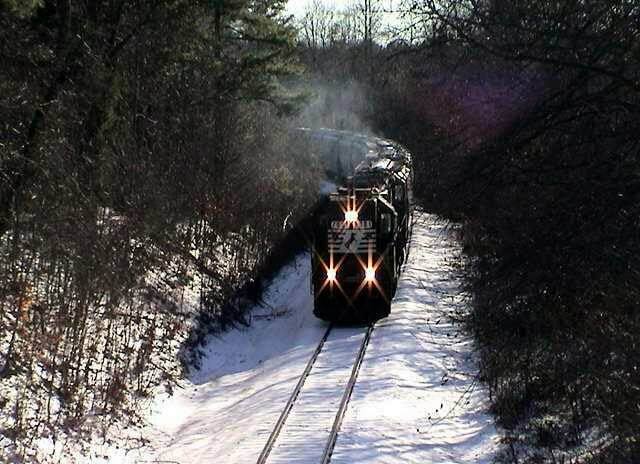 If one was living to experience the era of the steam locomotive, the shrill of a whistle and the cadence of the smokestack would resonate for miles across the open western Rowan County countryside. Moving south from the overpass spanning US Highway 70 at Barber, the railroad enters the rural domain of farmland and woods towards Bear Poplar. There is no public access for a few miles here as the right of way is bordered by private property on both sides. Within this stretch, the track crosses a 260 foot long bridge spanning Withrow Creek before emerging at the Bear Poplar crossroads and Highway 801. Bear Poplar is a bucolic location along the railroad but historically is of little commercial importance. One shipper located here was the Steele's Feed and Seed which operated a grain silo. The business closed many years ago but the spur that served it still exists. Bear Poplar was a flag stop when passenger trains operated over the line. A history of Mount Ulla would be that of a farming region that has passed through generations of families. This heritage of agriculture remains today yet it has also lent itself to those seeking a respite from the urban reaches to the south. Its history pertaining to the railroad has been small commercially but for the location of a flour mill and as a scheduled stop for the passenger trains of yesteryear. 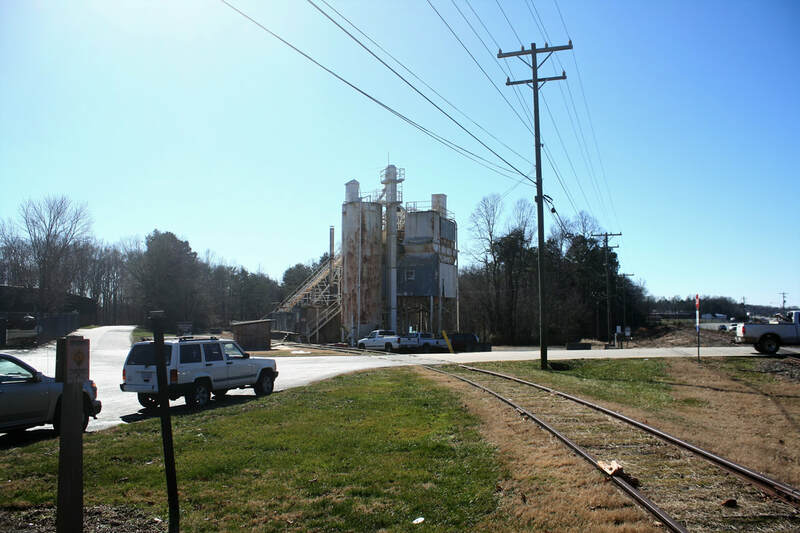 For years, the Mount Ulla Flour Mill stood as a solitary industry amidst a rural community. The history of this business is sparse but information from a local resident suggested that it began production during the 1920s. It remained in business for approximately 50 years before ceasing operation during the 1970s. During the late 1980s, your author passed this structure frequently but never photographed it when the spur that served it was intact. Although no industry remains at Mount Ulla it still resonates with railroad activity. In addition to the daily passage of P23, the train frequently stops here for car storage. 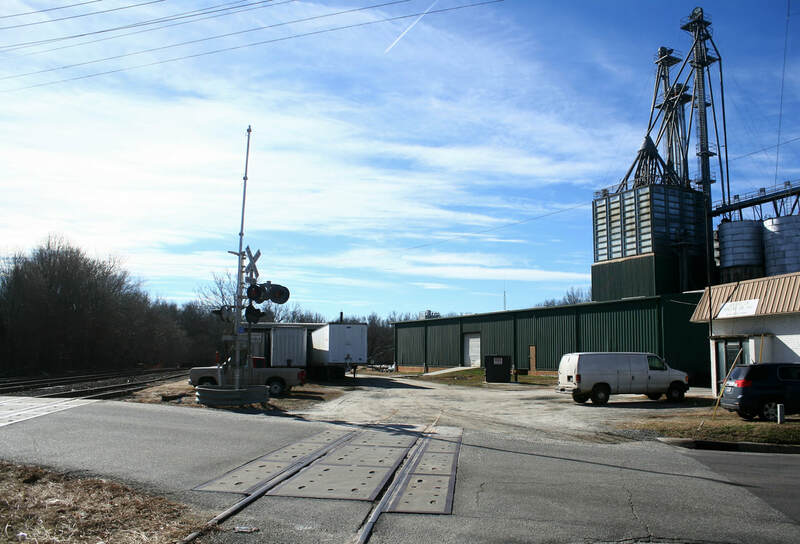 The 1900 foot Mount Ulla siding is used to stage cars for furtherance to Mooresville or Barber depending train volume for any given day. Mount Ulla is among the best locations on the L Line for photography. Highway 801 parallels the railroad for its entire length through the community facilitating ease of access with a number of photo locales. There are interesting settings to incorporate and the light is good as well. A time travel trek to the not too distant past would reveal the tiny hamlet of Mazeppa as an area of rolling terrain sprinkled with generational family farms. No rail shippers were located here even in past decades; hence, its only importance was as a flag passenger train stop as needed. It was not until late in the 20th century that this area immediately north of Mooresville would transform into industrial prominence for the railroad and via annexation, for the city of Mooresville. Until late 1990s, the southern end of the L line was sparse with on line shippers. 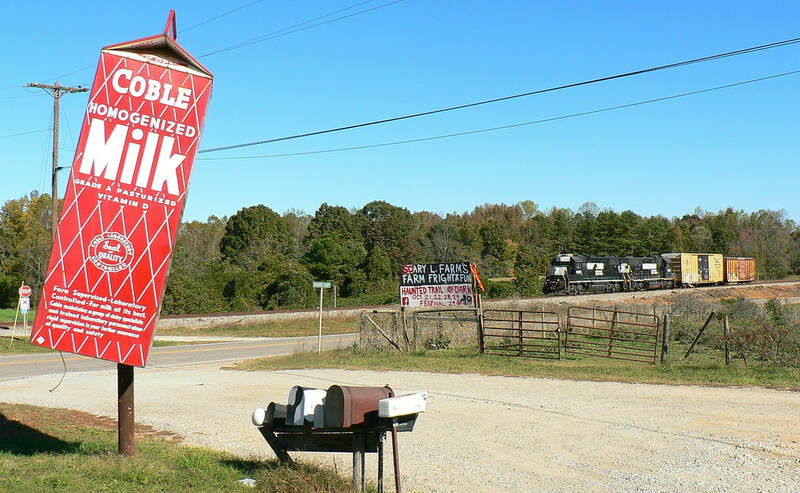 Between Barber and Mooresville, only two businesses of consequence had been served by the railroad--Steele's Feed and Seed at Bear Poplar and the Mount Ulla Flour Mill. At the time of the industrial park development, both were gone. Ironically, no shippers remained at Mooresville along the L Line either as the remaining ones were located along the former AT&O route. Suffice to say, until the advent of the new business at Mazeppa and operational changes that occurred on AT&O (O Line), the L Line from Barber to Mooresville was a sector of railroad devoid of traffic sans the occasional extra movement. 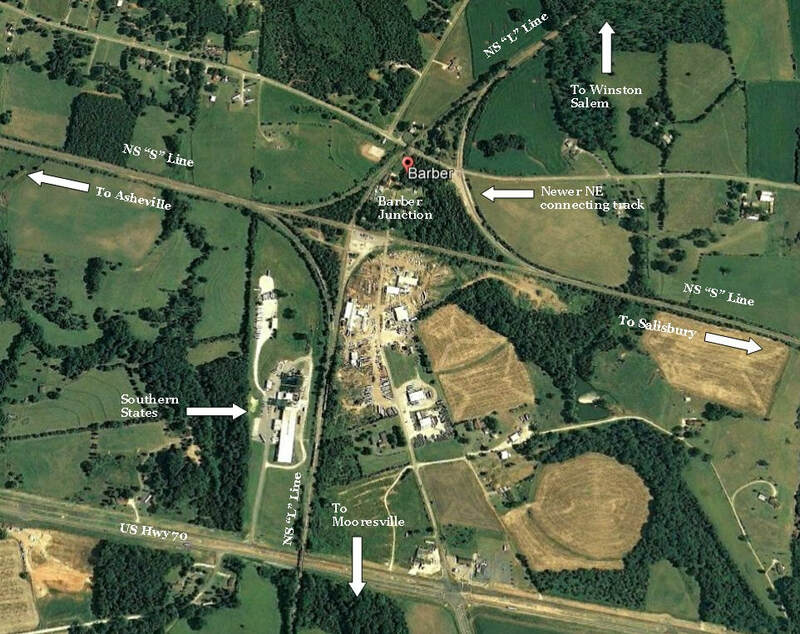 Google Earth view of the industrial park at Mazeppa (Mooresville) with the active rail shippers identified. This complex generates a substantial number of carloads for Norfolk Southern and is the greatest volume location on the length of the L Line. To date, four large volume rail shippers populate the industrial park---Berry Plastics, WestRock, Pactiv, and the Cardinal FG Company. 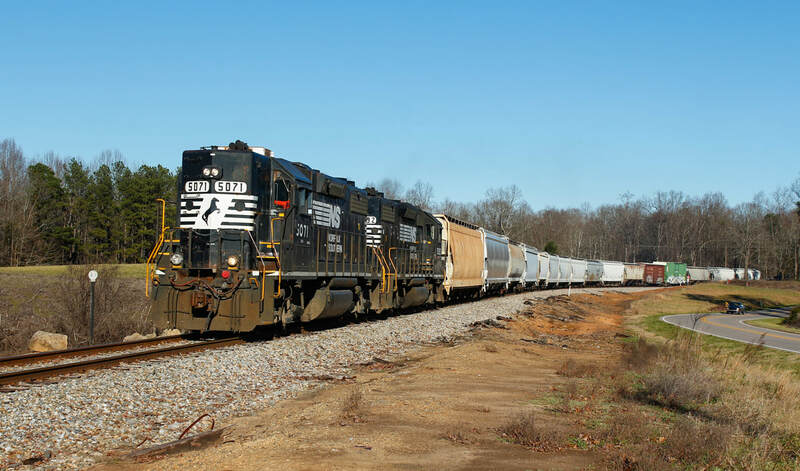 Because of the number of carloads at any given time, Norfolk Southern constructed a 2300 foot runaround track to accommodate the switching moves. At the the time of this writing, the tempo of activity has increased to a level that NS has dispatched train P23 on weekends and/or second sections as needed. 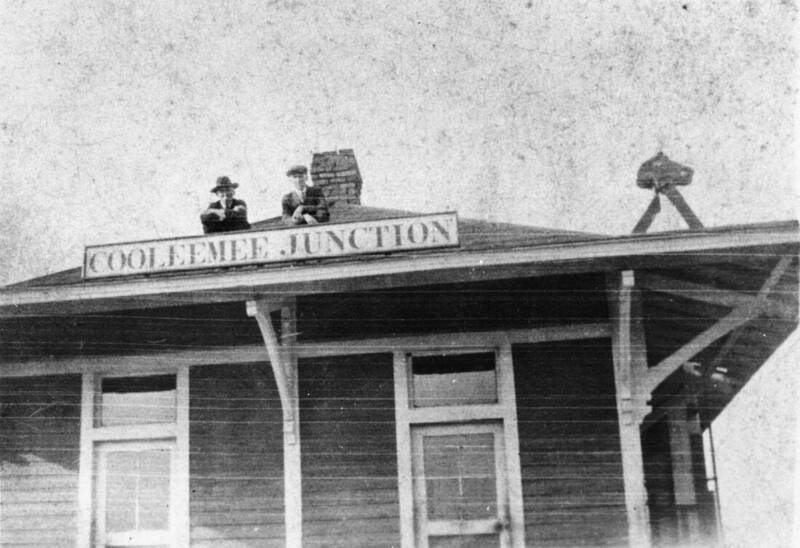 When the Southern Railway completed the original North Carolina Midland Railroad extension to Mooresville in 1898, the town had been previously established as a railroad location. 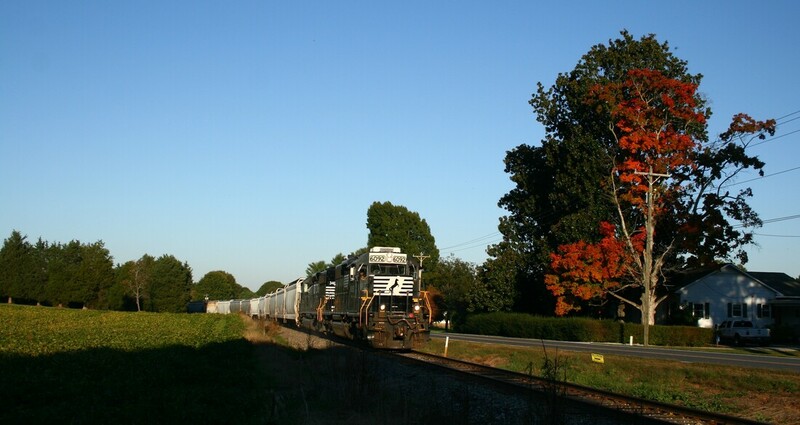 It was foremost an AT&O community as that route traversed the heart of the town as the near mid-point of a rail corridor connecting Statesville and Charlotte. 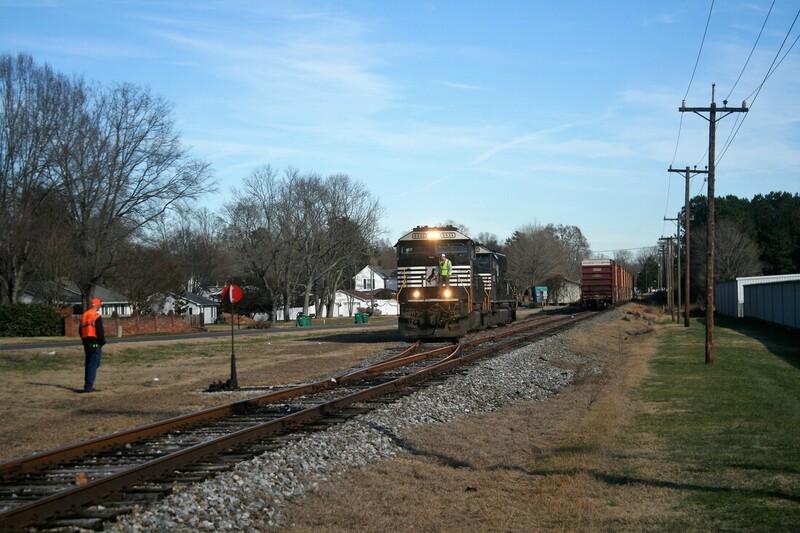 What the arrival of the railroad from Winston Salem did create, however, was an alternate route through Mooresville thereby directly connecting two of the largest cities in North Carolina. The location was established as a junction for two separate routes that increased the stature of Mooresville as a passenger terminal and passing through freights for the Winston Salem-Statesville- Charlotte triangle. Google Earth view of Mooresville Junction as it is today. 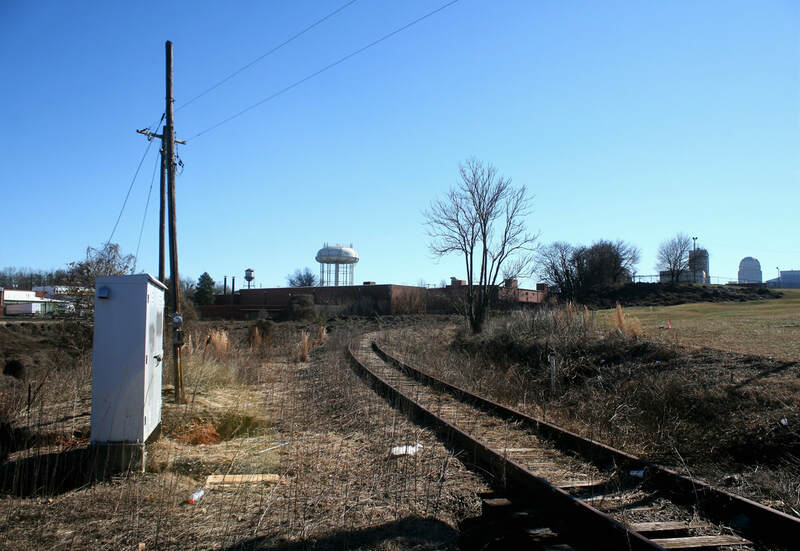 The southern terminus of the L Line is here where it meets the AT&O (O Line) route that once connected Statesville and Charlotte. As the O Line is abandoned to the north and out of service to the south, the L Line is the only access to the city shippers. 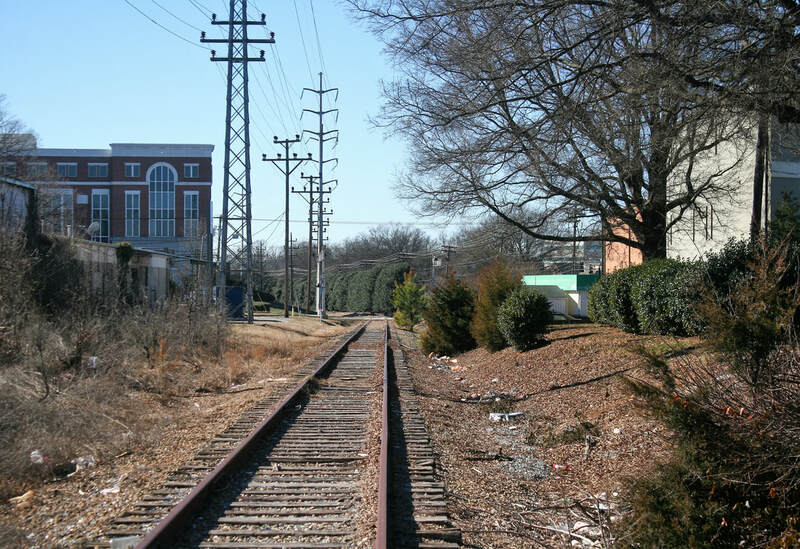 Throughout the span of years, the L Line remained primarily a through traffic corridor at Mooresville until the 1980s when regularly scheduled trains between Winston Salem and Charlotte were abolished. Also, in 1983 the AT&O was abandoned between Barium Springs and Mooresville eliminating traffic to and from Statesville. 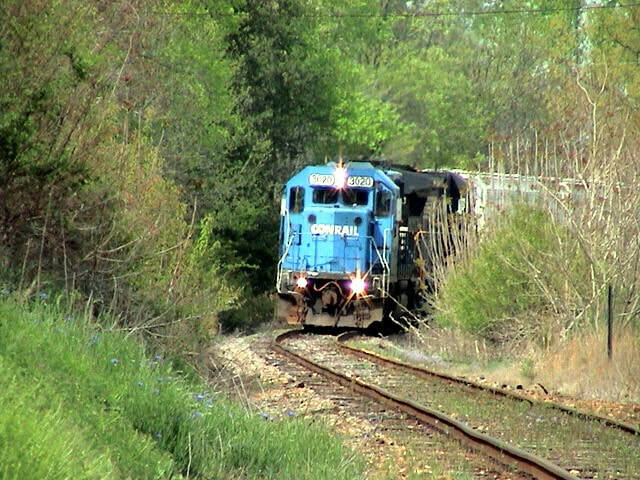 During the 1990s, traffic remained sporadic on the line because the industry in Mooresville at that time was switched by a Charlotte-Mooresville turn. It was the development of the Mazeppa industrial park near the change of the millennium shifted the operational emphasis to the L Line from Barber. With the implementation of NS P23 from Barber, it also inherited the work directly in Mooresville. Only two shippers remained but they were--and remain--high density carload industries. Bay State Milling and NGK Industries along the O Line combined with the industrial park have made Mooresville the busiest location on the railroad today. Quite a reversal from the established norm that had existed for many decades. The Mooresville of yesteryear included two customers along the L Line and both were within the last mile preceding Mooresville Junction. In 1908, the Dixie Mills opened for business during the booming years of textile expansion. It operated under this name until 1924 when the name was changed to Cascade Mills and again in 1933, renamed as Cascade Weaving under Burlington Industries ownership. During its history, it experienced both expansion and idle periods as well as a receivership that led to the purchase by Burlington. An industrial fixture in Mooresville for 75 years, the plant ceased production in 1982. Occupying a tract of land bounded by Mooresville Junction was the W.N Johnston & Sons coal yard, a small independent coal dealer. History of the business is vague as to its origins but it had vanished by the end of the 1960s. It was served by a spur just north of the junction and held the distinction as the southernmost shipper along the L Line. Forecasting the future of any rail corridor is ambiguous at best. Speculative predictions are made in the context of the present in a rapidly changing environment of which unforeseen factors can seemingly develop overnight. The L Line of the future certainly falls within this scenario. At present, it exists (in conjunction with the Mooresville-Charlotte O Line) as a branch line for the purpose of local service. Its secondary main line function has long since vanished; nevertheless, the potential exists for it to be reinstated as such. 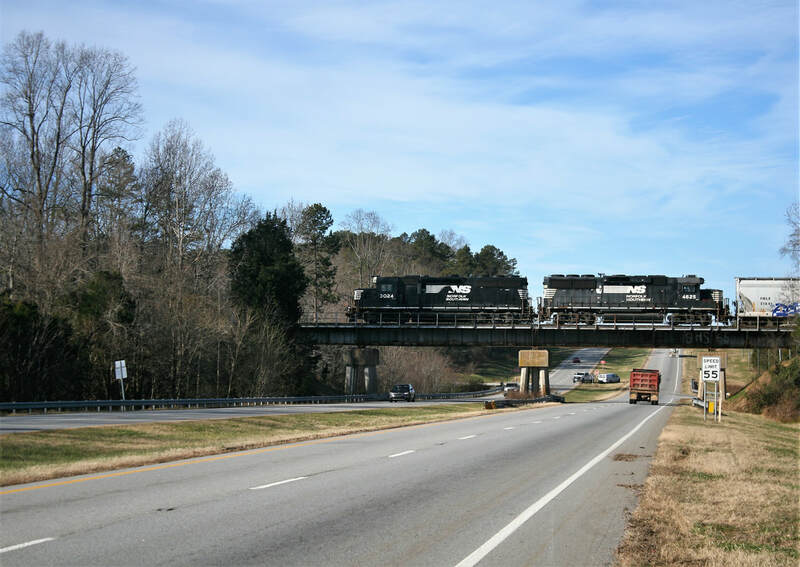 In its reduced stature it remains a rail corridor not only connecting two major cities in North Carolina but also traversing the expanded metro areas of both municipalities. 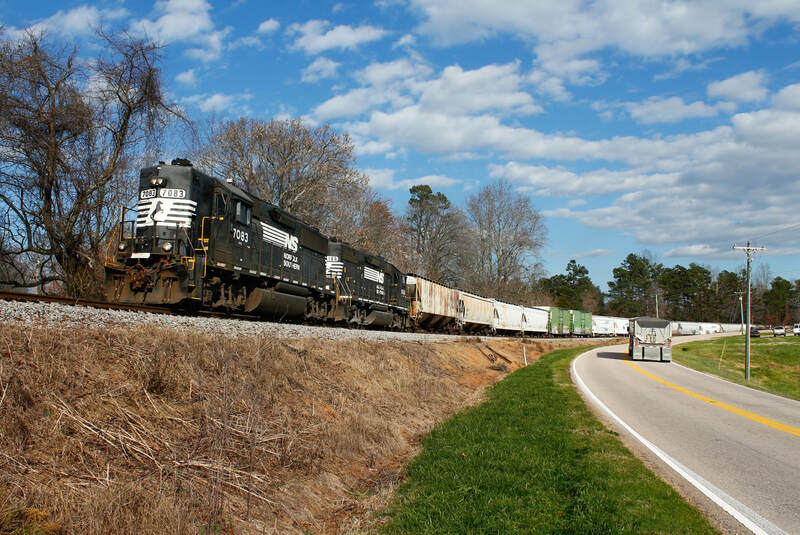 Although Norfolk Southern de-emphasized the route decades ago, it is also cognizant of its potential importance as an alternative to the North Carolina Railroad of which it leases for the main line corridor between Greensboro and Charlotte. Realistically, this agreement will remain renewable. Though the L Line/O-Line combination exists as a buffer, the expense of upgrading this route for heavy duty main line traffic would prove to be a capital project of prodigious cost. In the present day era of “precision scheduled railroading”—-in which operational practices are based upon reductions with contracting rail networks to appease operating ratios---and Wall Street---the likelihood of such a project is prohibitive. 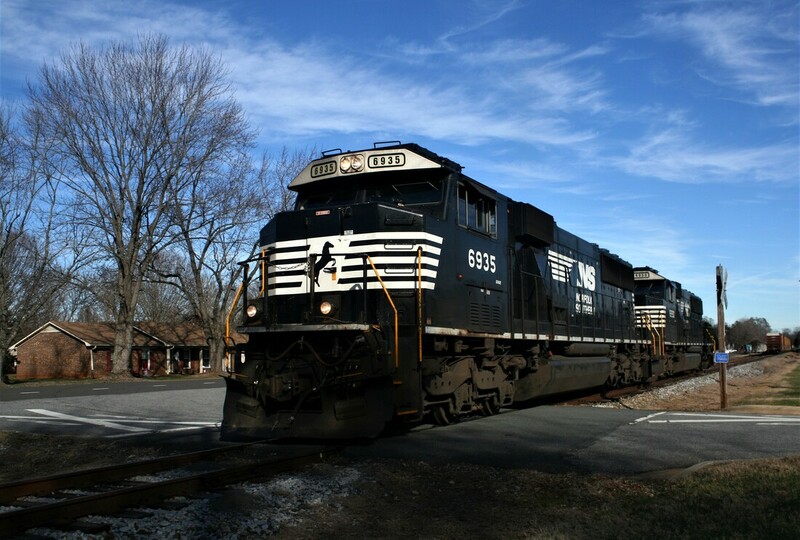 External political pressure has been exerted on Norfolk Southern for the development of co-existing use on the route—primarily Mooresville to Charlotte on the O Line—for light rail. 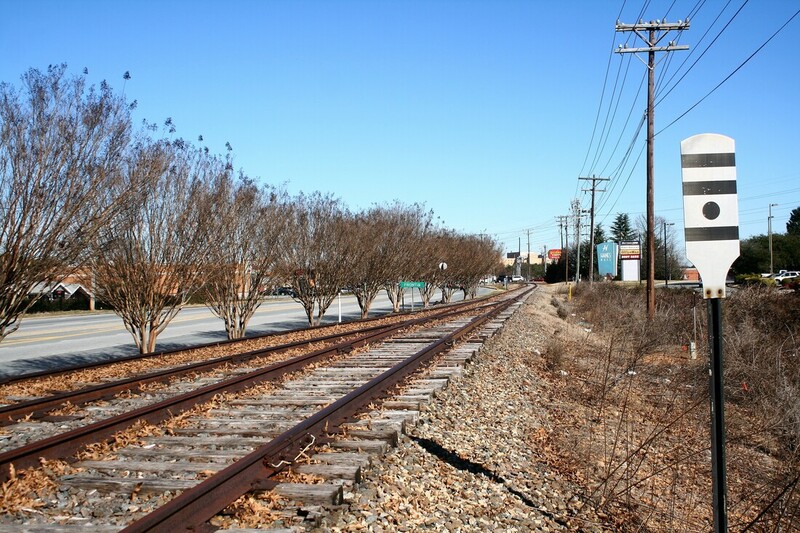 Feasibility studies also examined Winston Salem to Mocksville on the L Line. Combined, both lines would complete an intercity route as has also been suggested. At present, this, too, is a large magnitude pipe dream. At some point in the future—whether near or distant---the L Line may or may not experience a renaissance. Others will write that chapter if and when it occurs probably beyond the lifetime of this author.